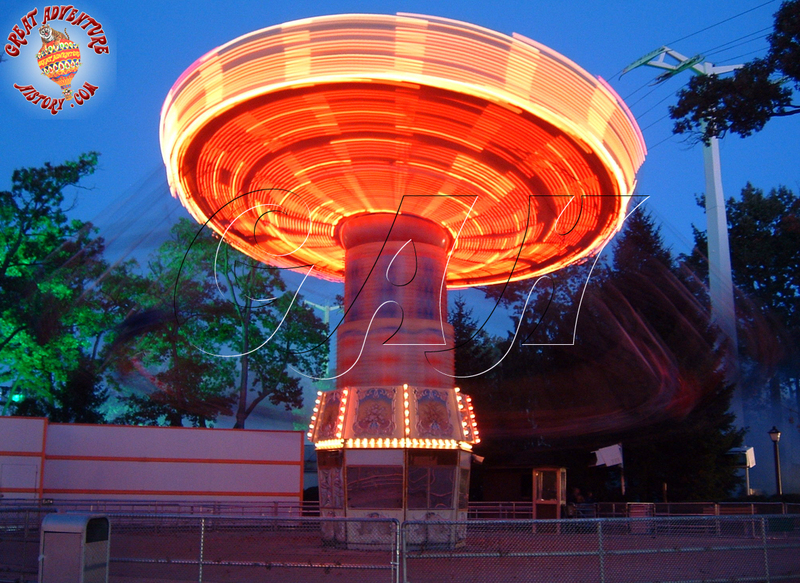 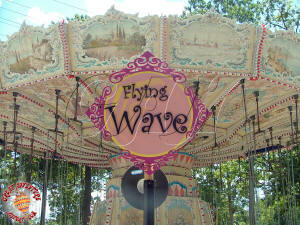 One of the most popular rides in theme parks and amusement parks around the world is the Wave Swing ride. 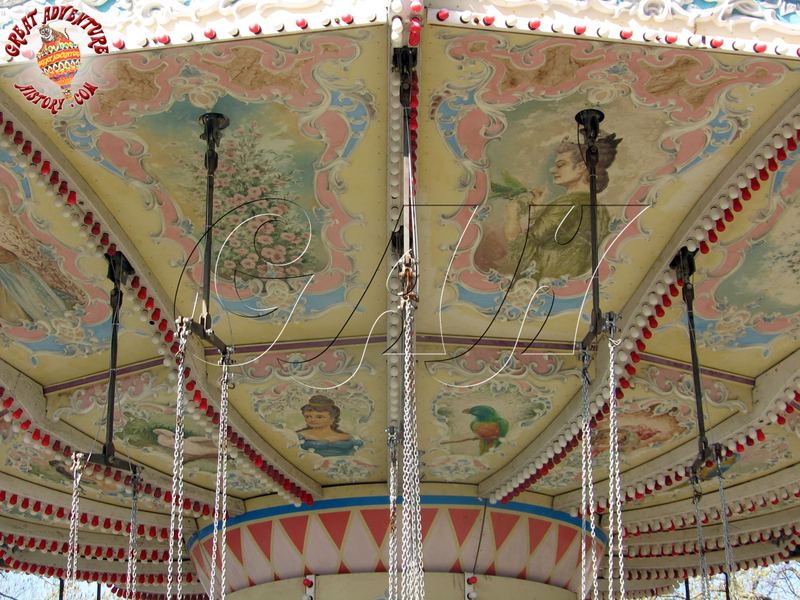 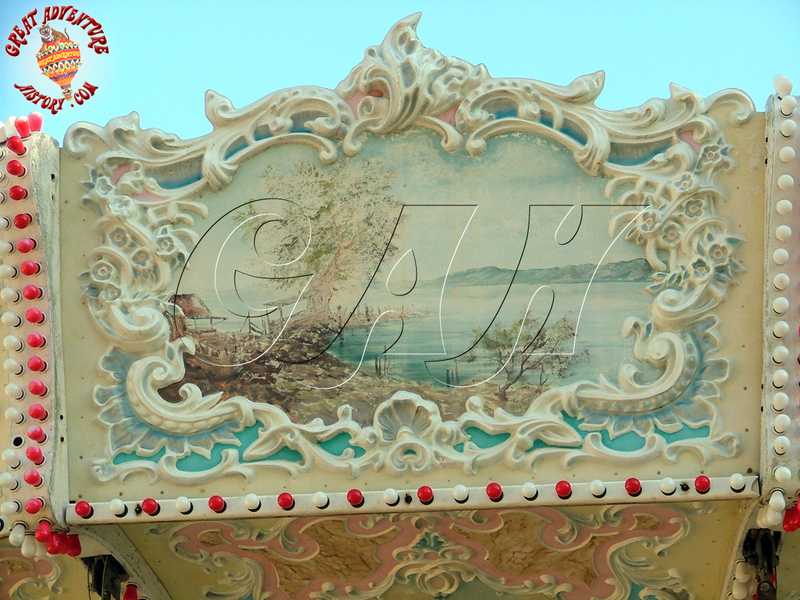 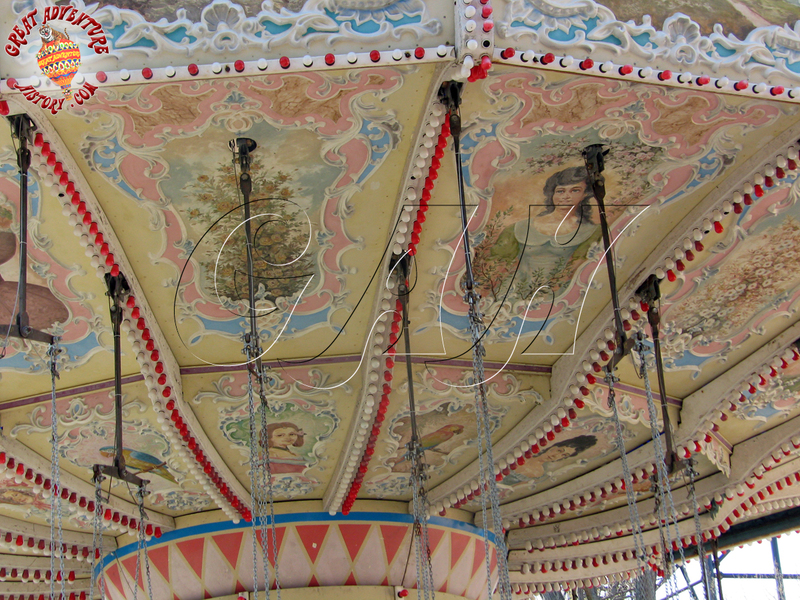 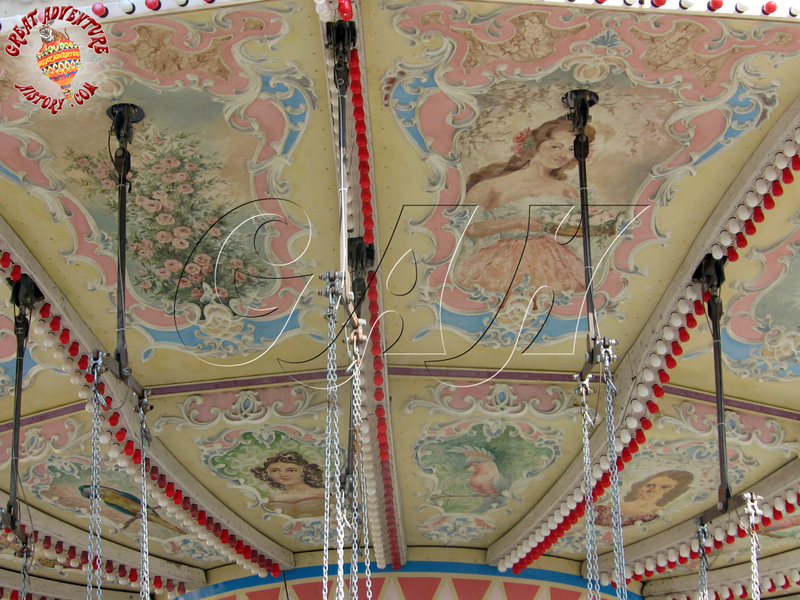 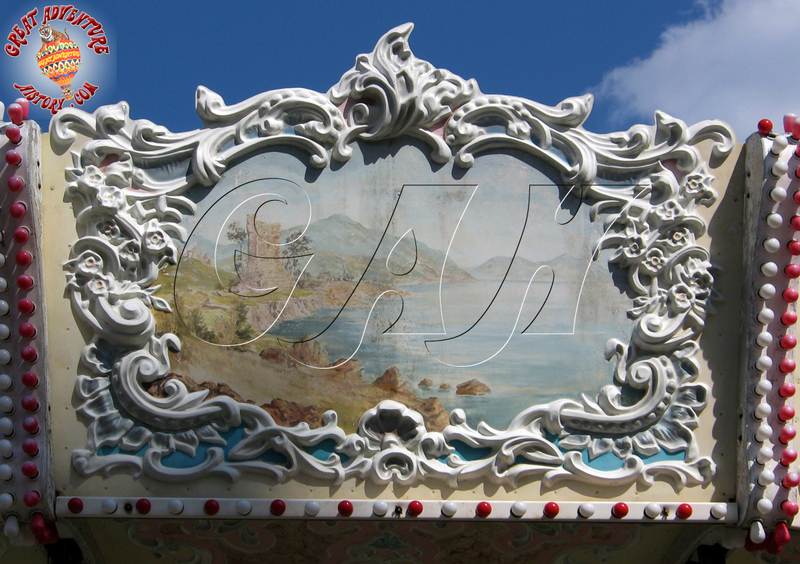 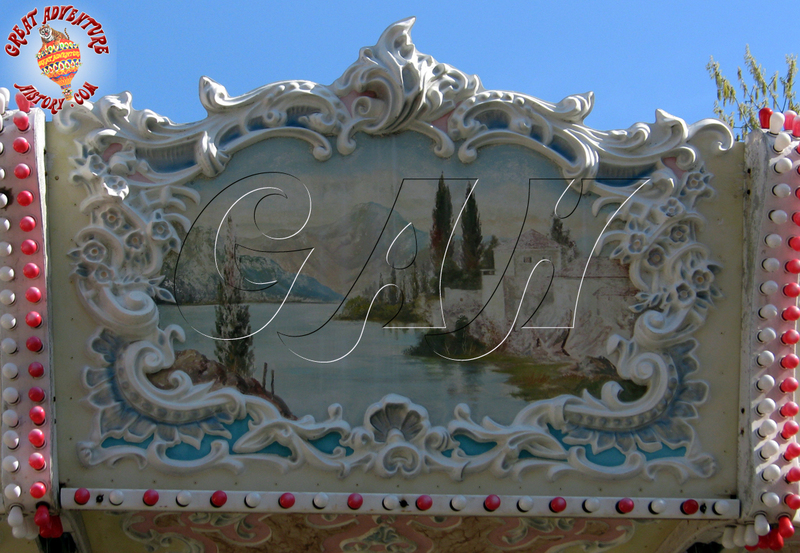 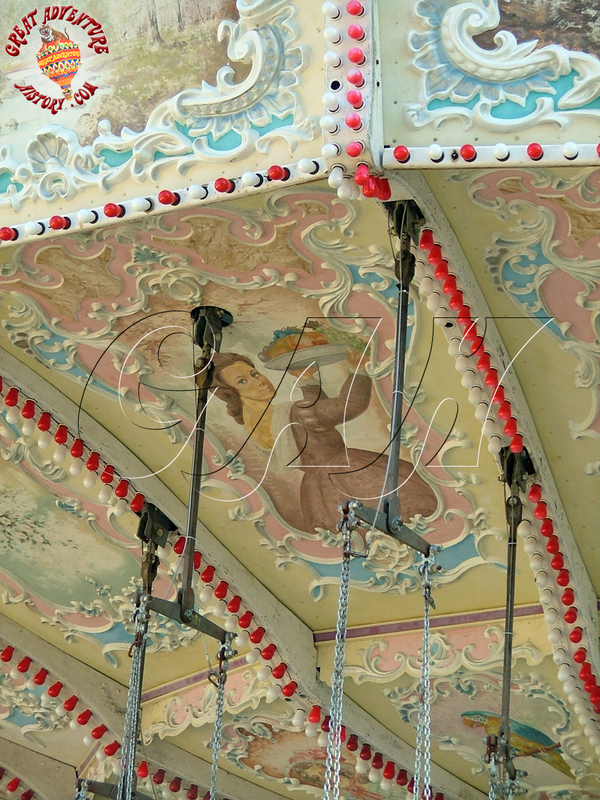 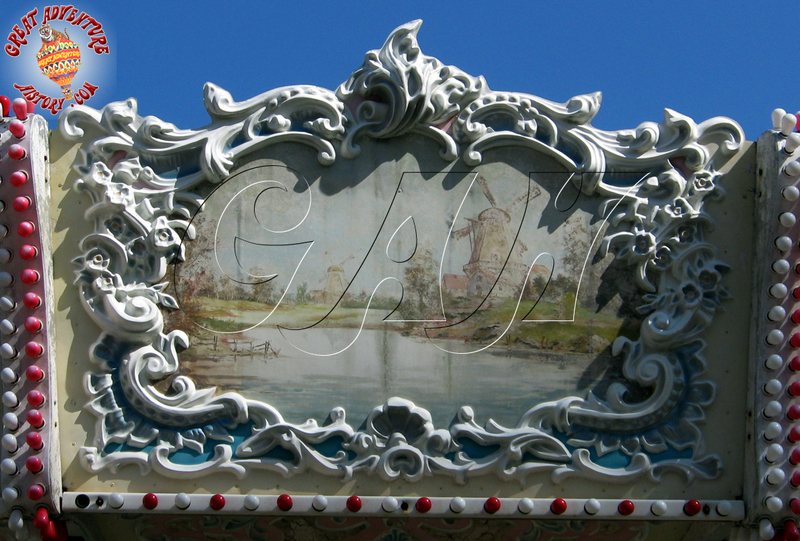 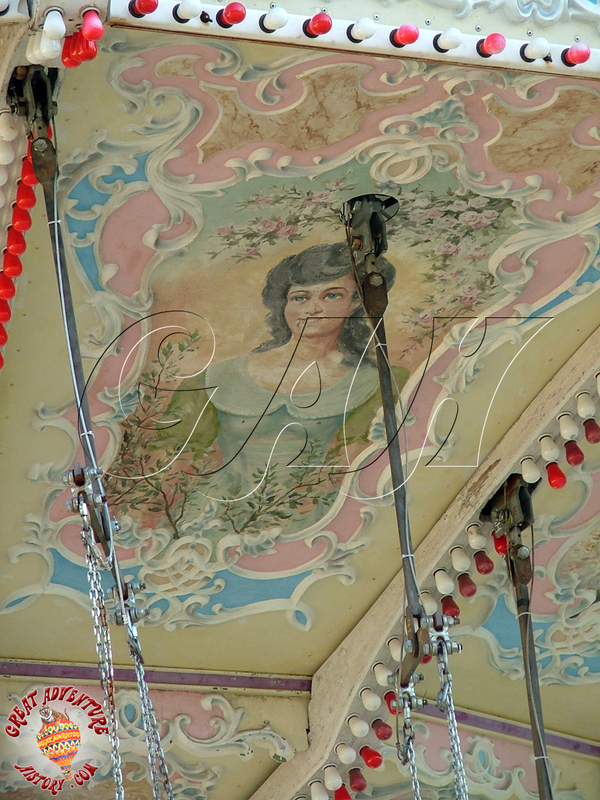 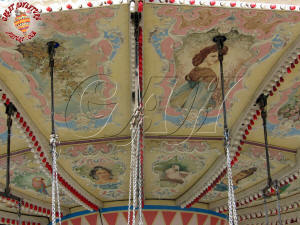 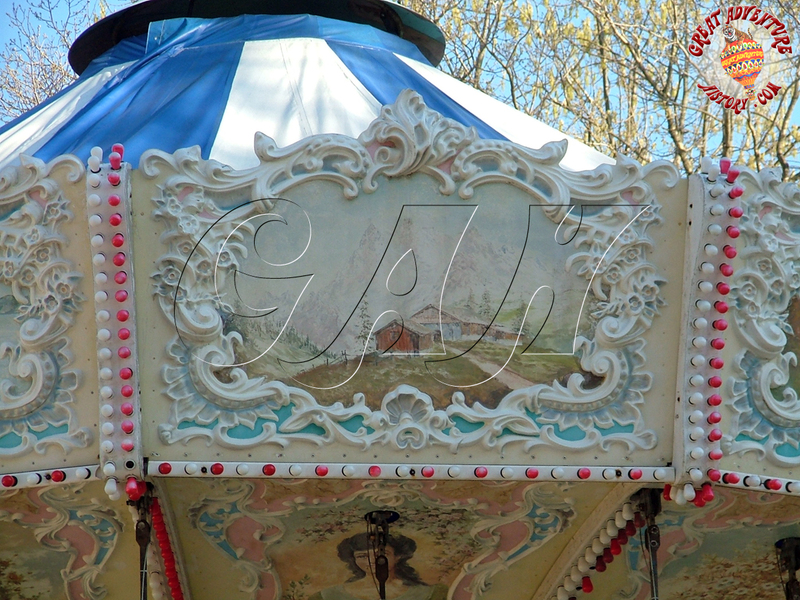 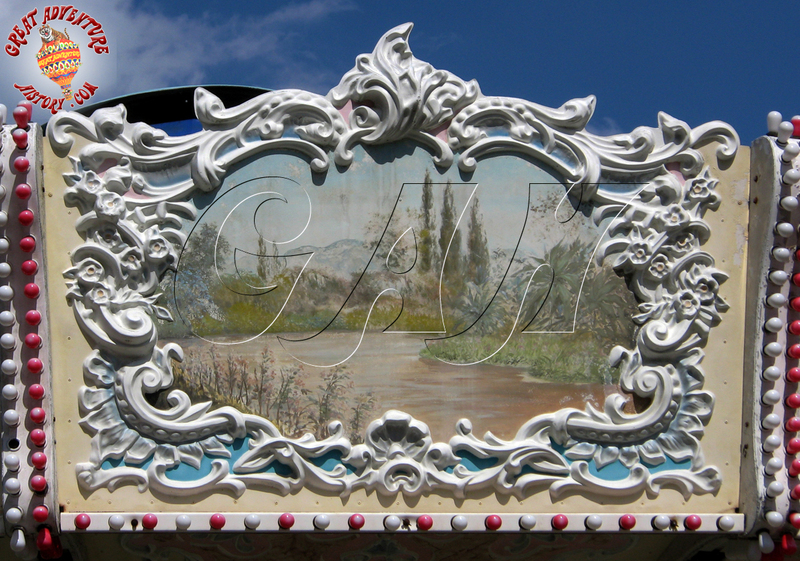 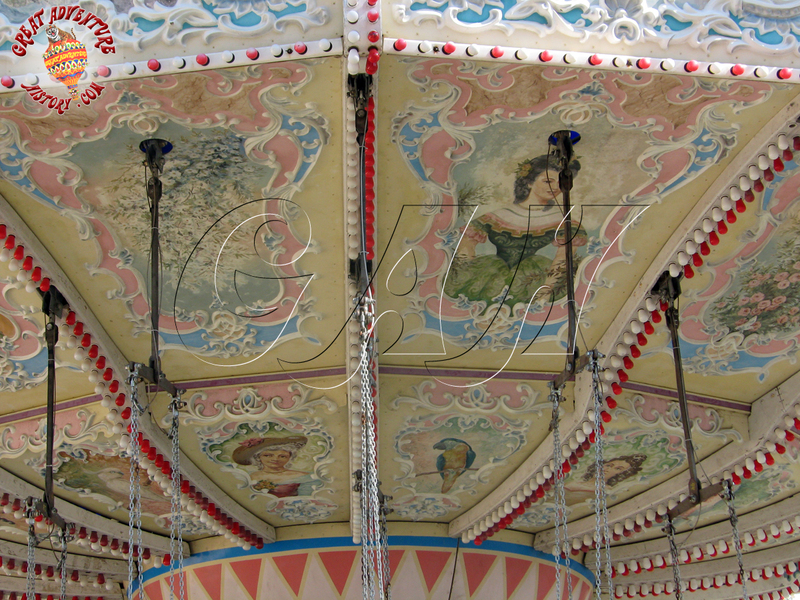 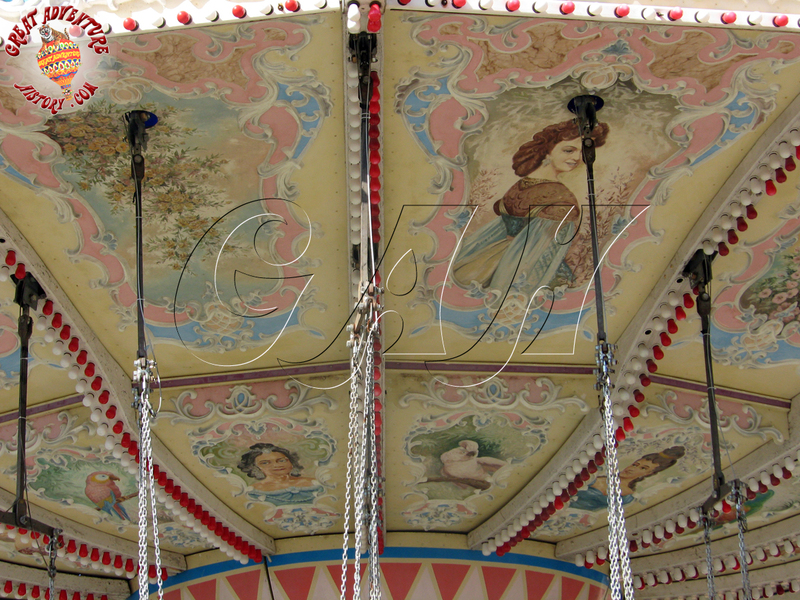 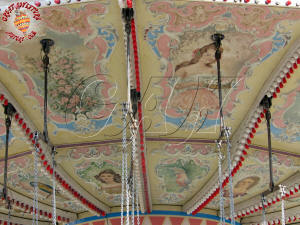 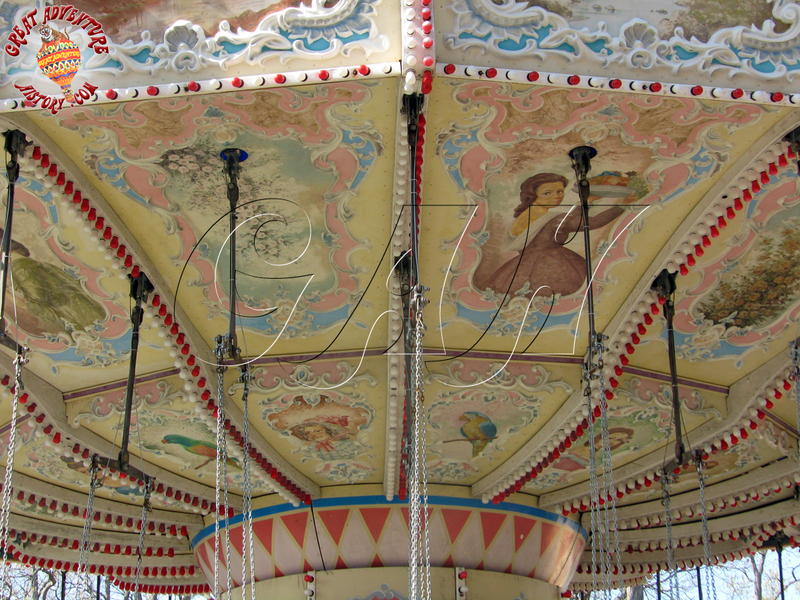 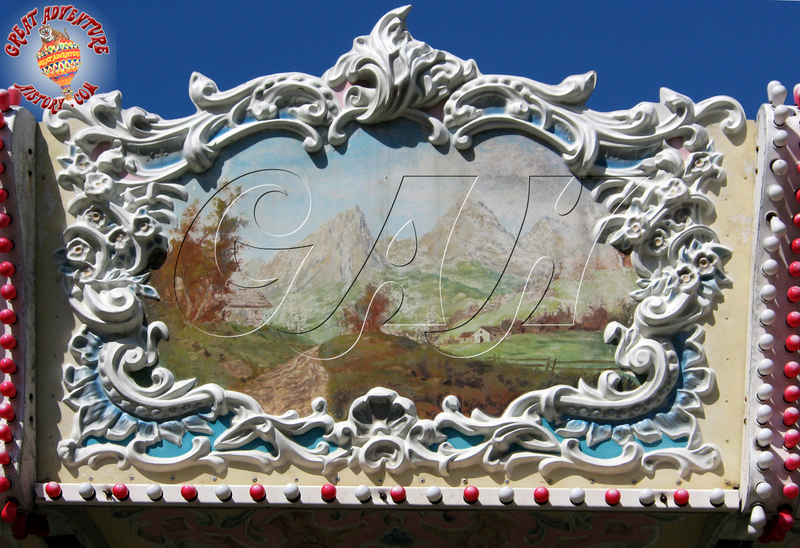 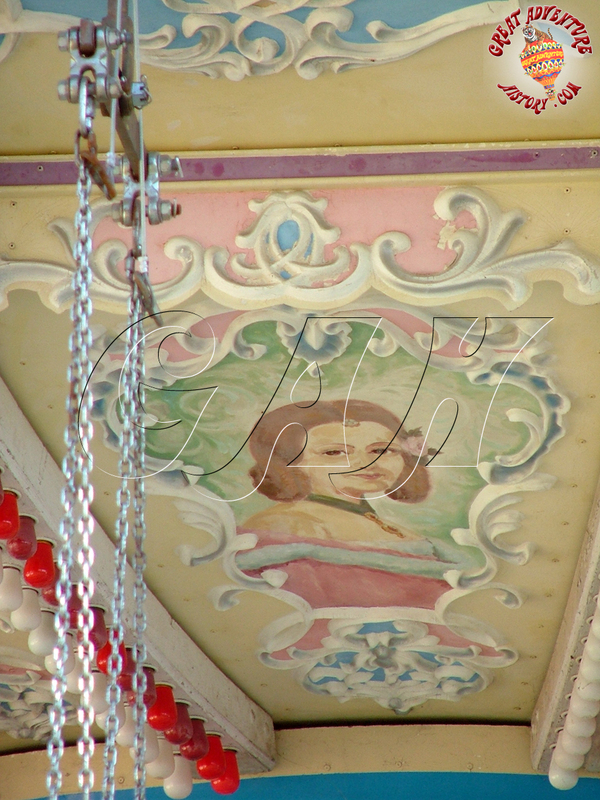 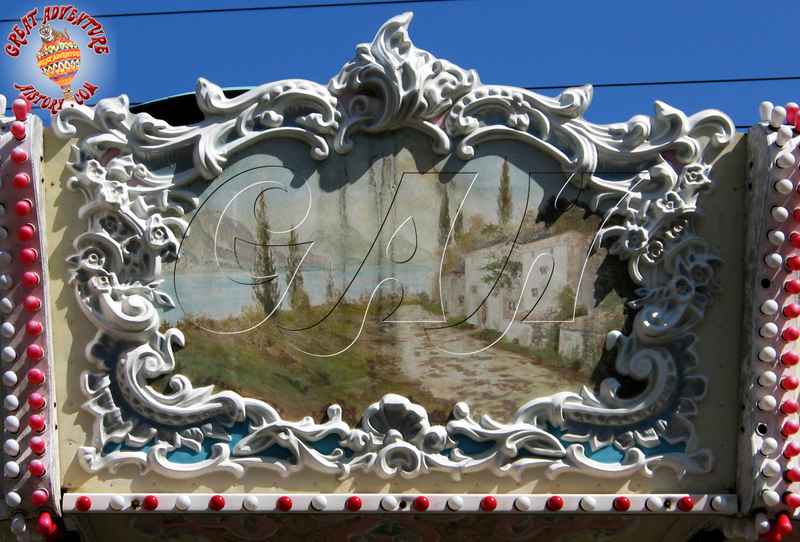 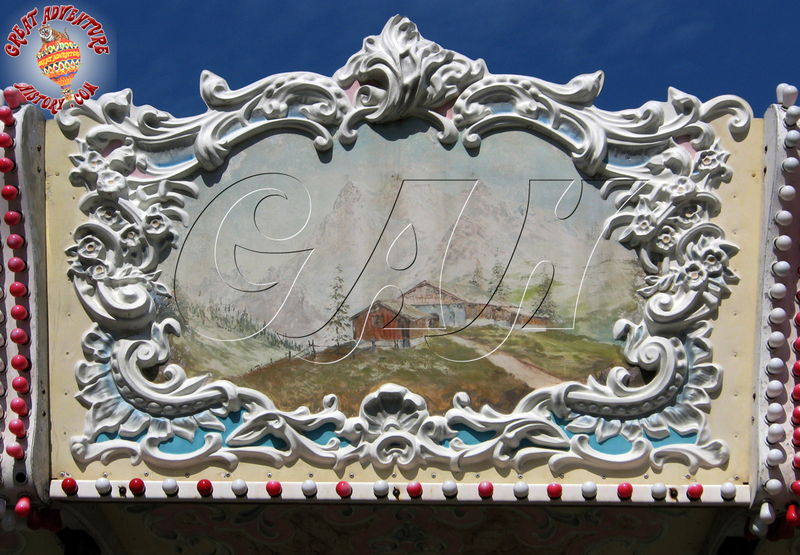 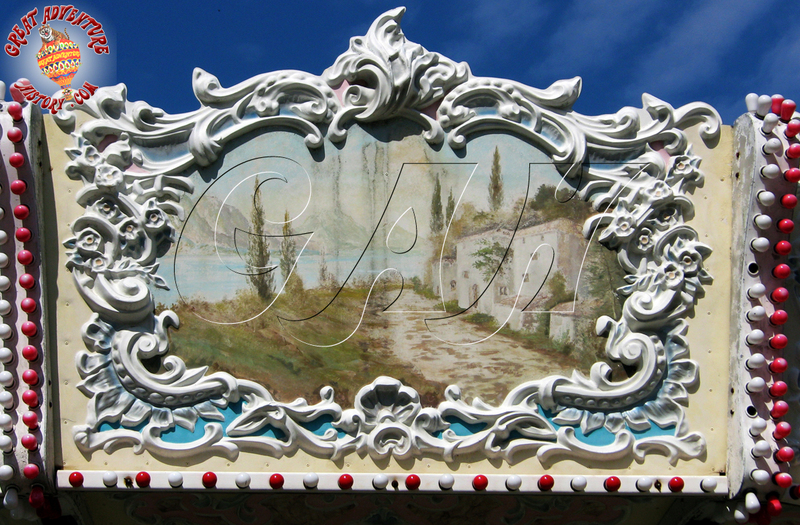 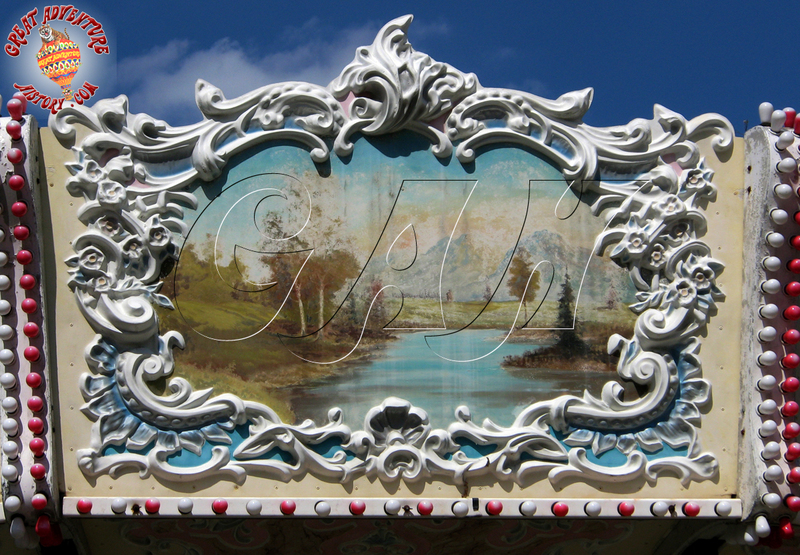 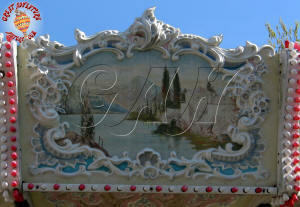 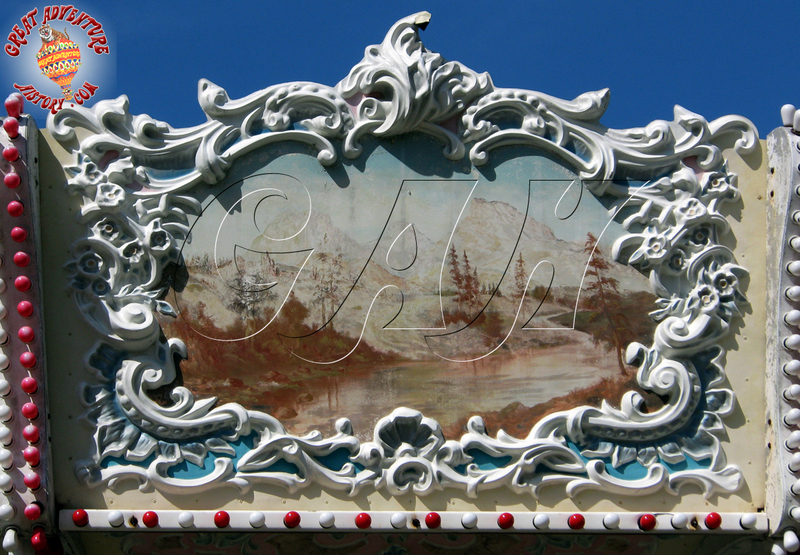 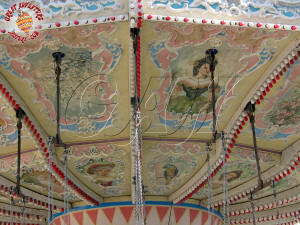 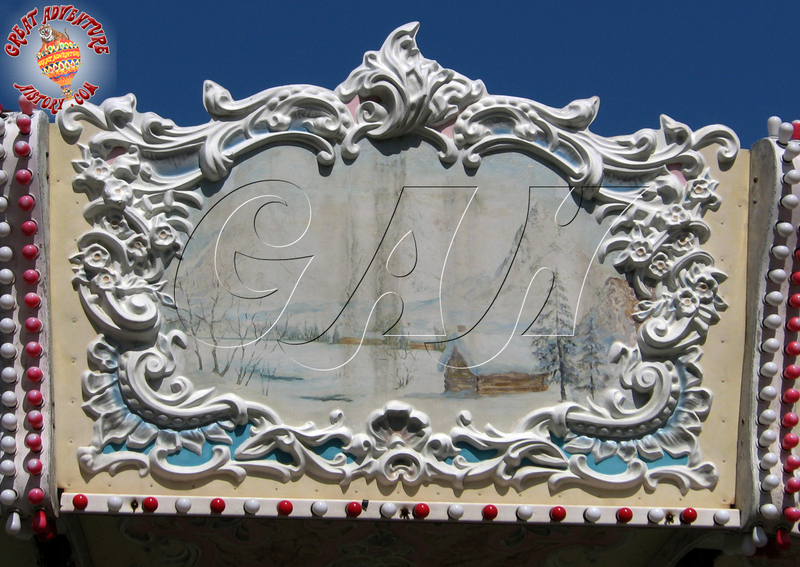 The most popular style of this ride is made by Zierer, and its seemingly delicate look makes it appear to be a much older version, with classic looking paintings and decorations adorning the ride's fiberglass panels. 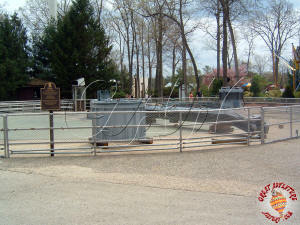 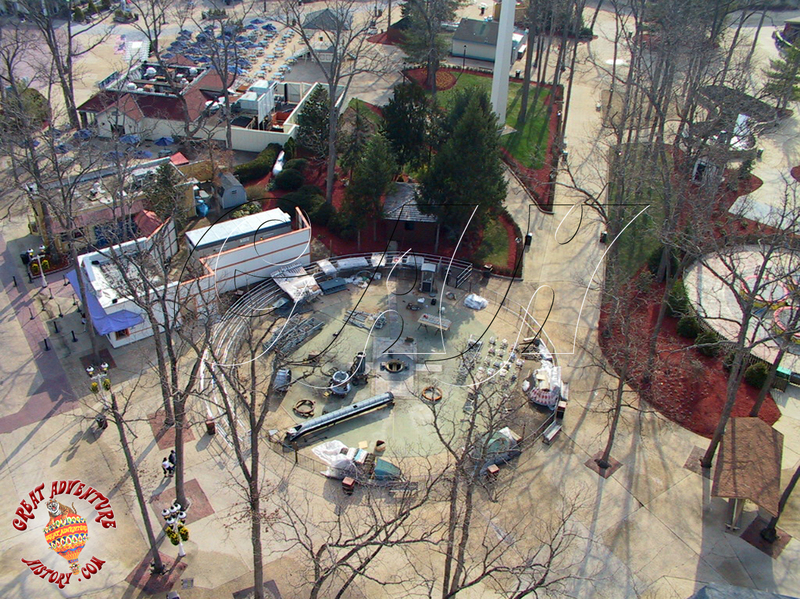 The model installed at Great Adventure was a park model version of the ride with 48 seats. 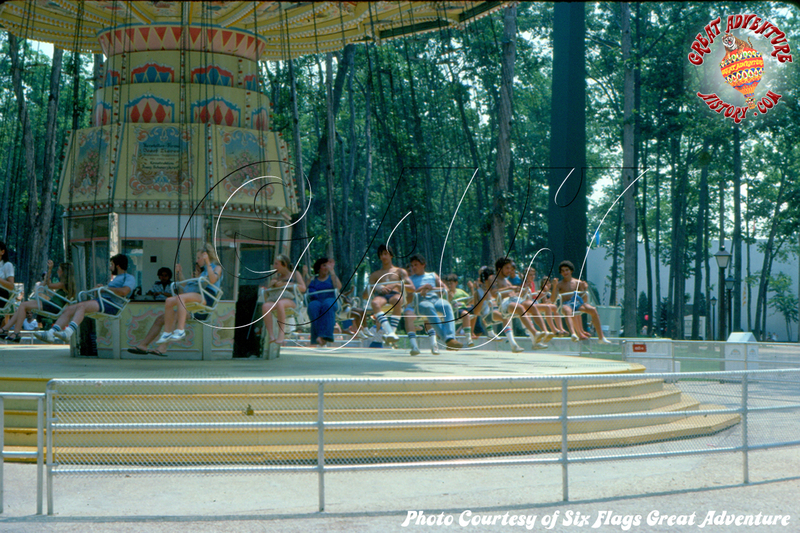 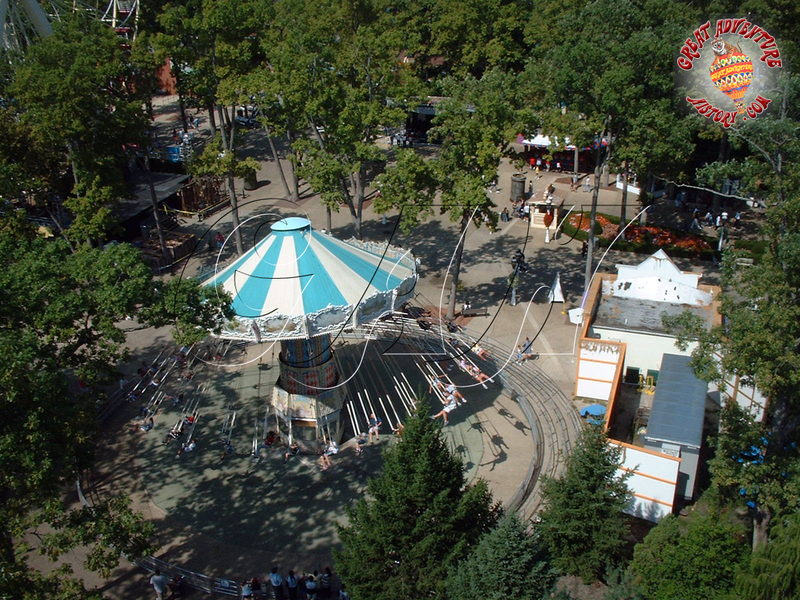 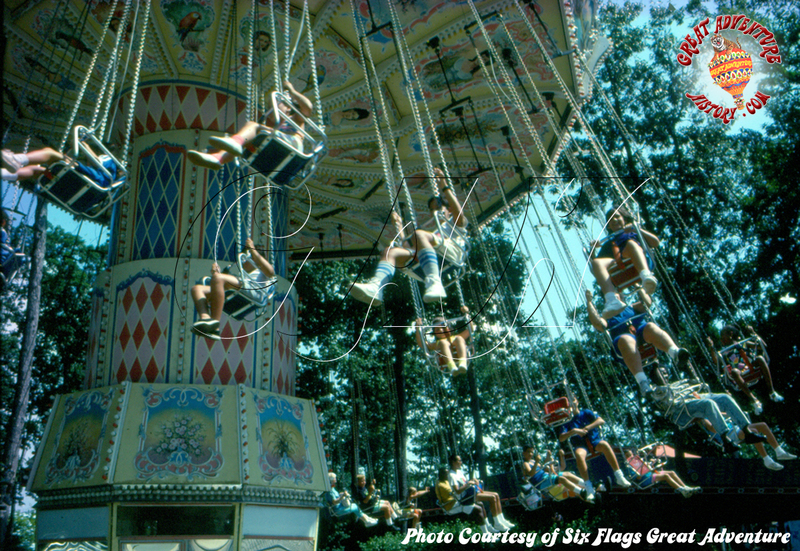 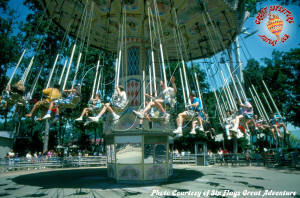 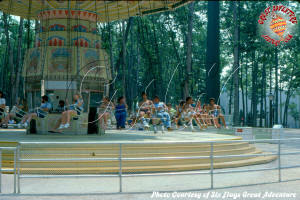 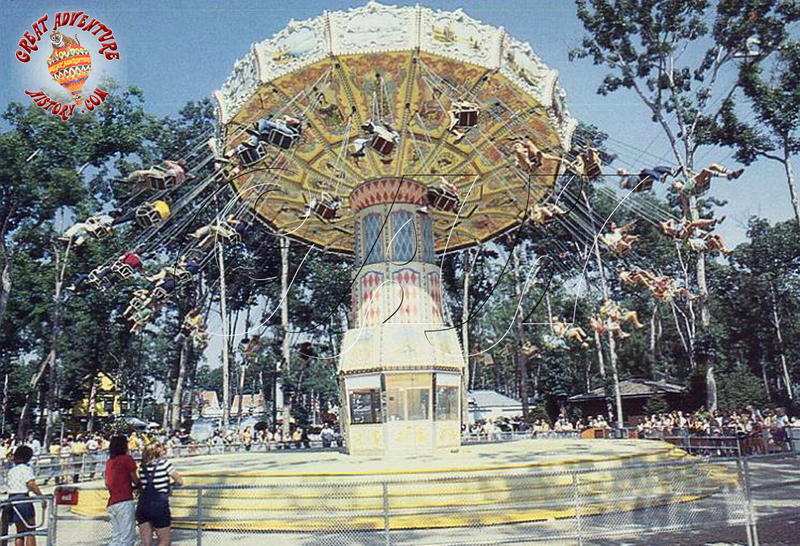 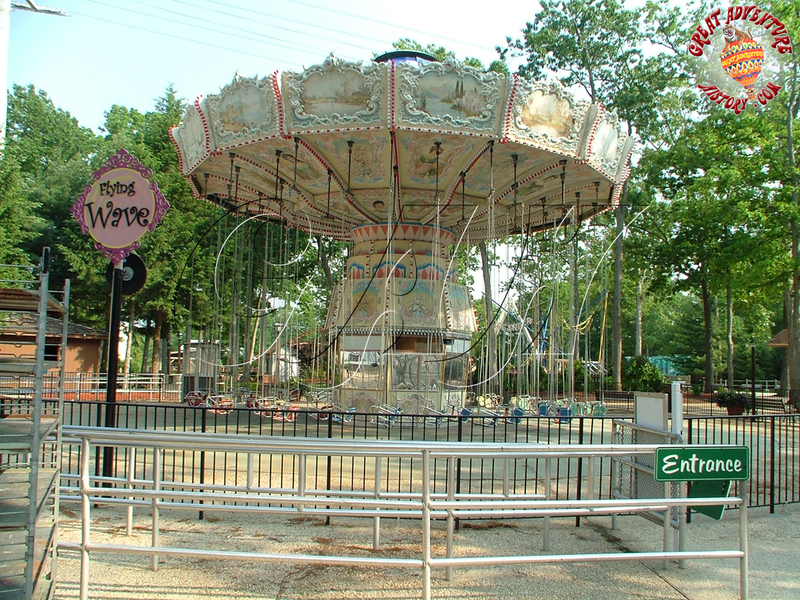 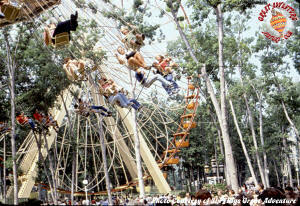 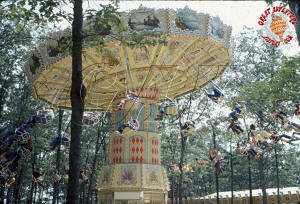 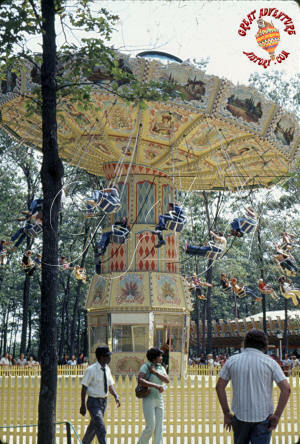 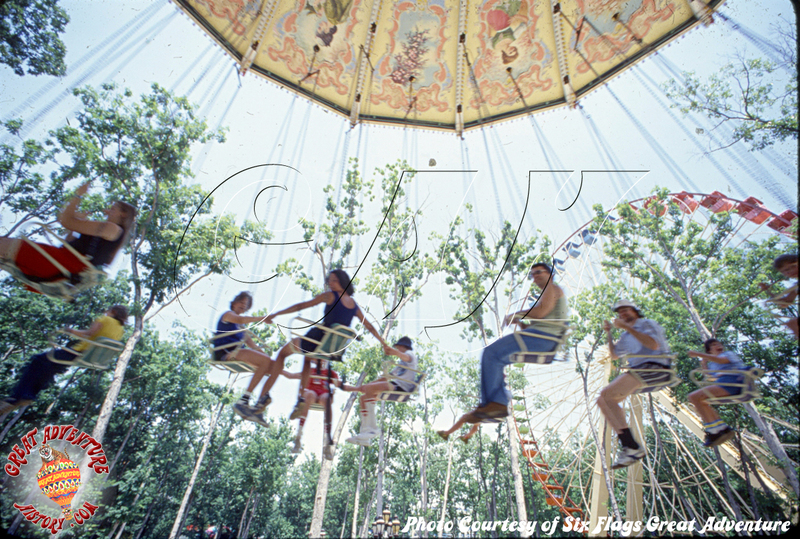 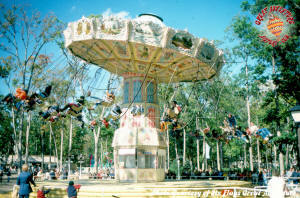 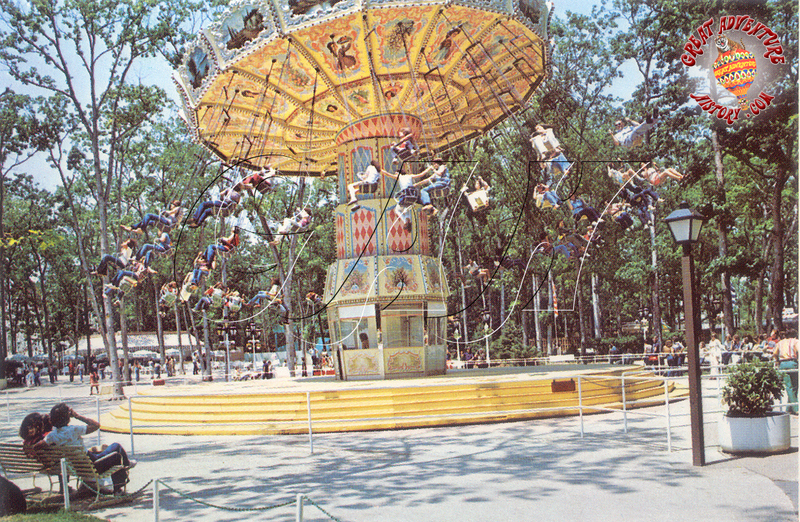 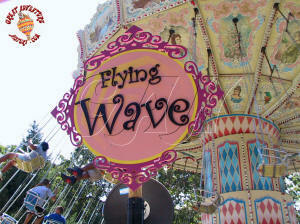 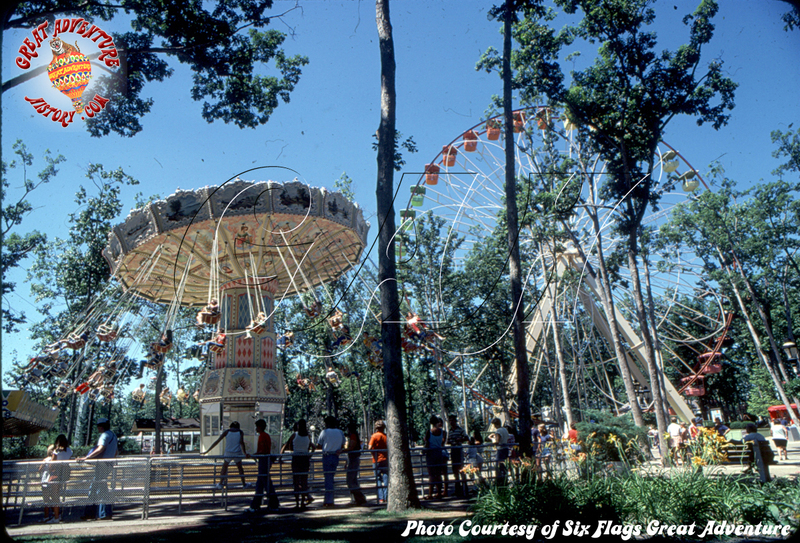 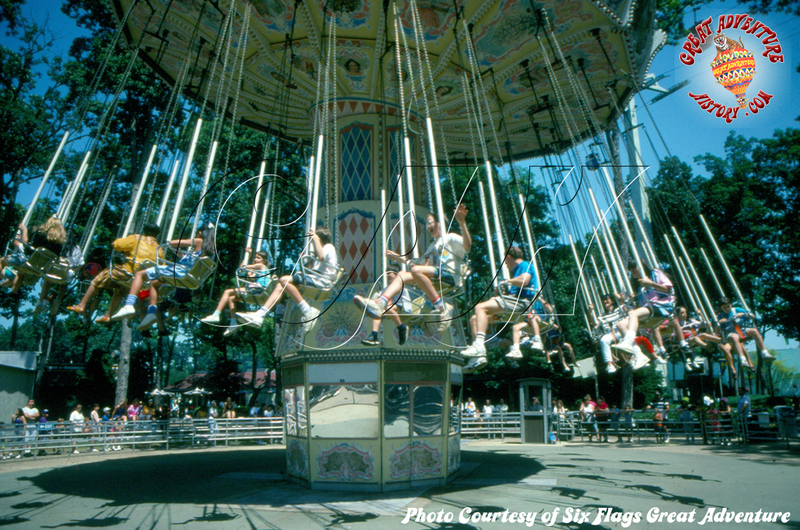 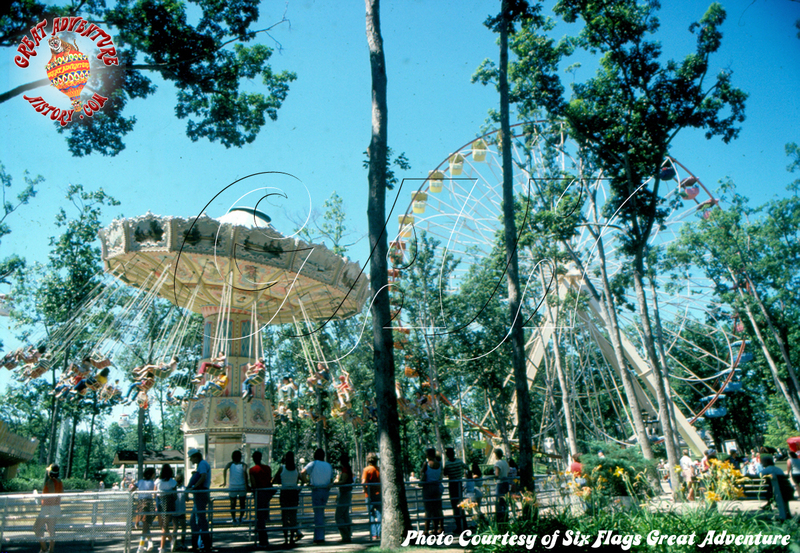 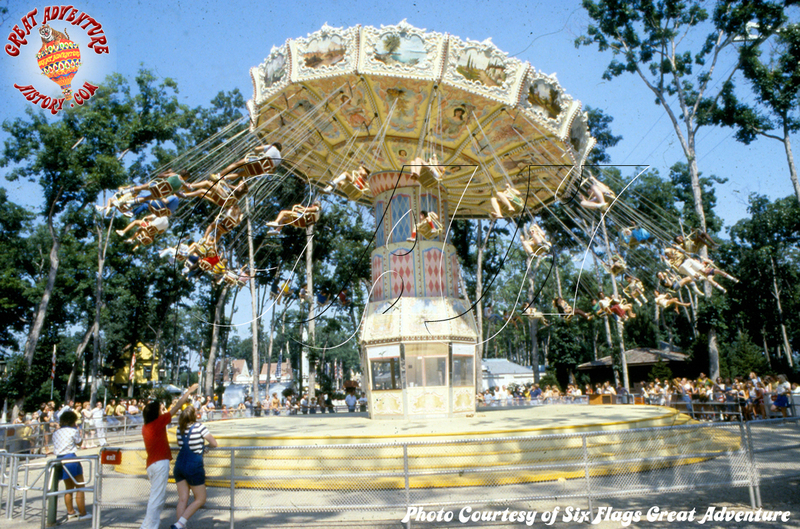 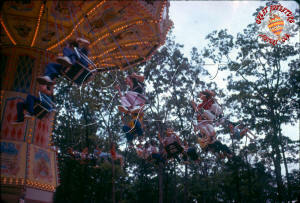 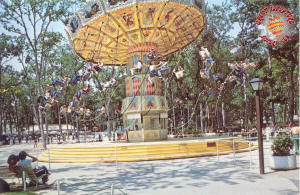 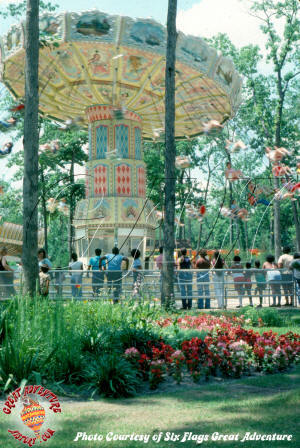 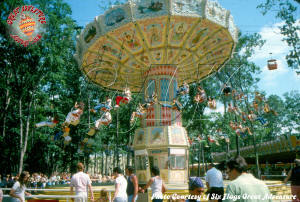 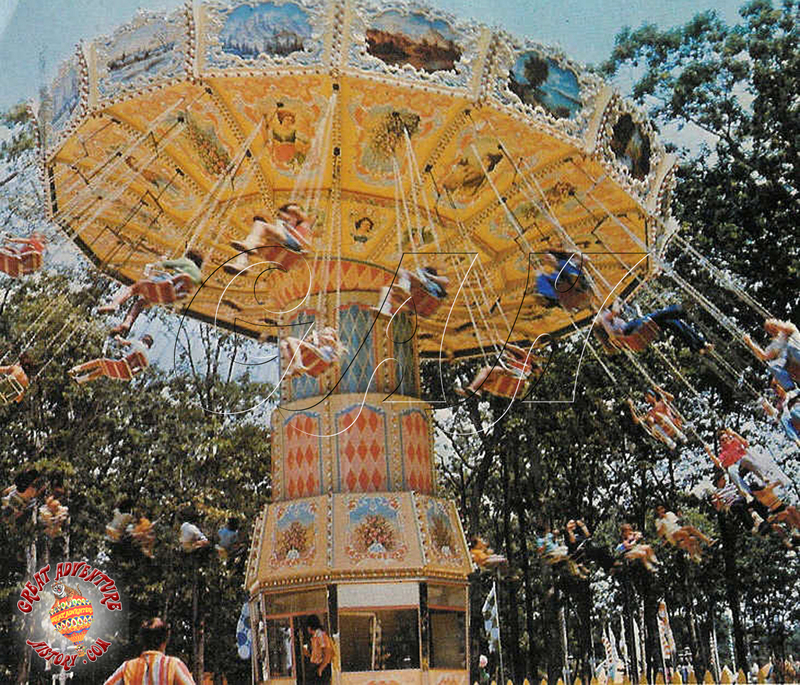 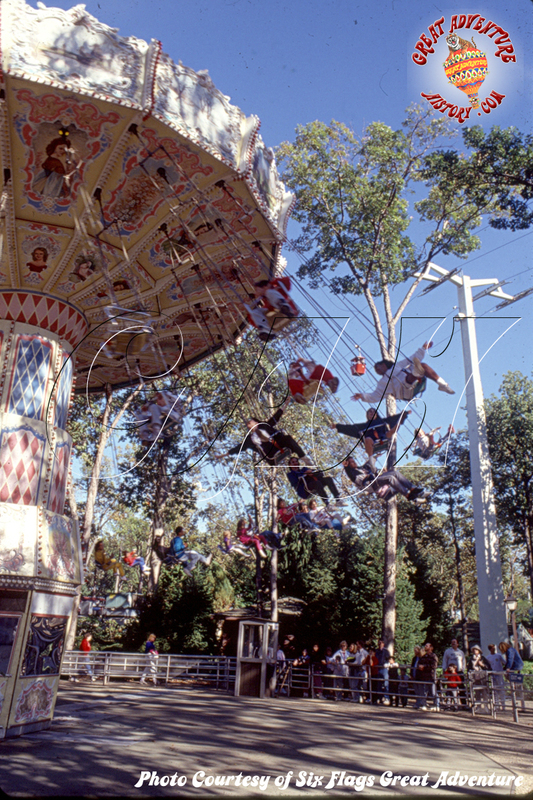 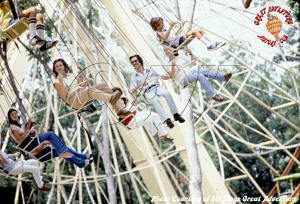 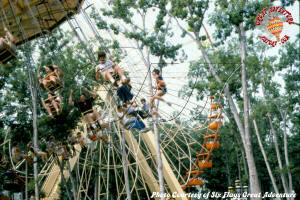 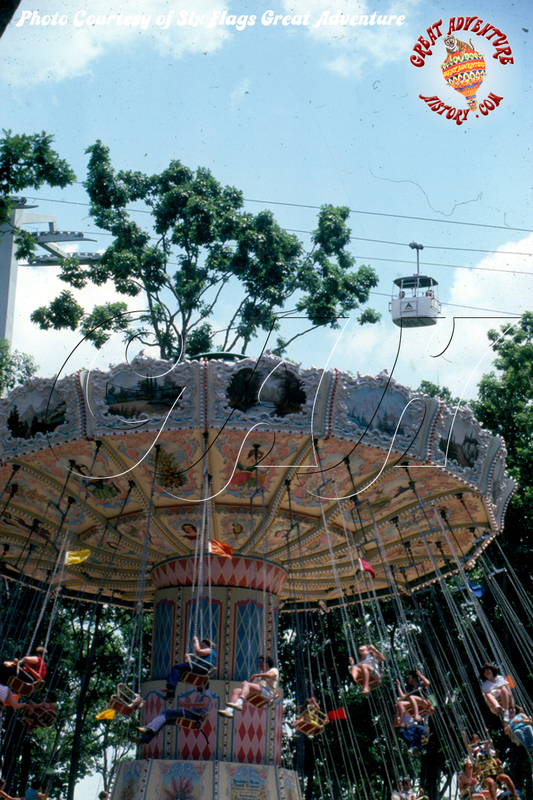 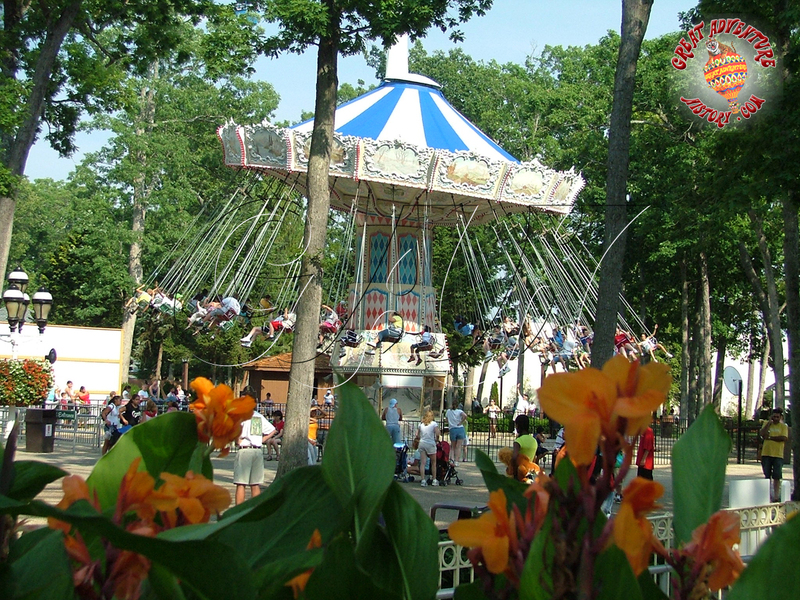 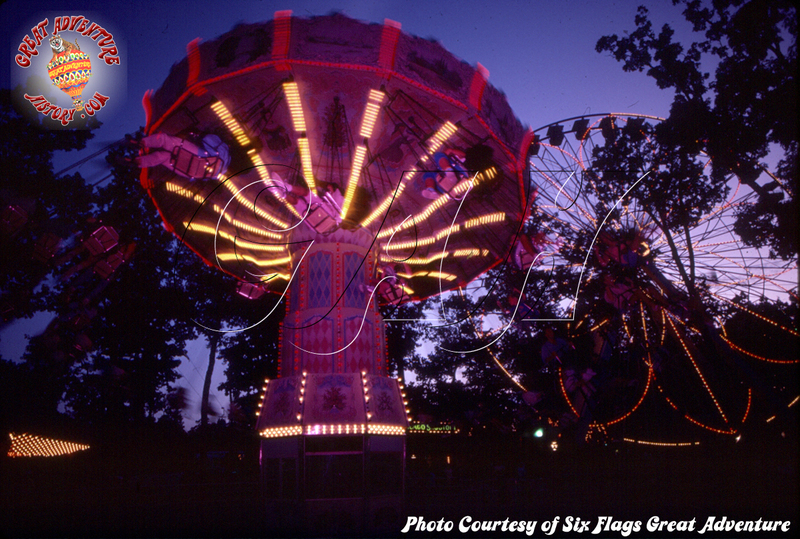 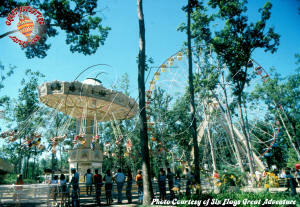 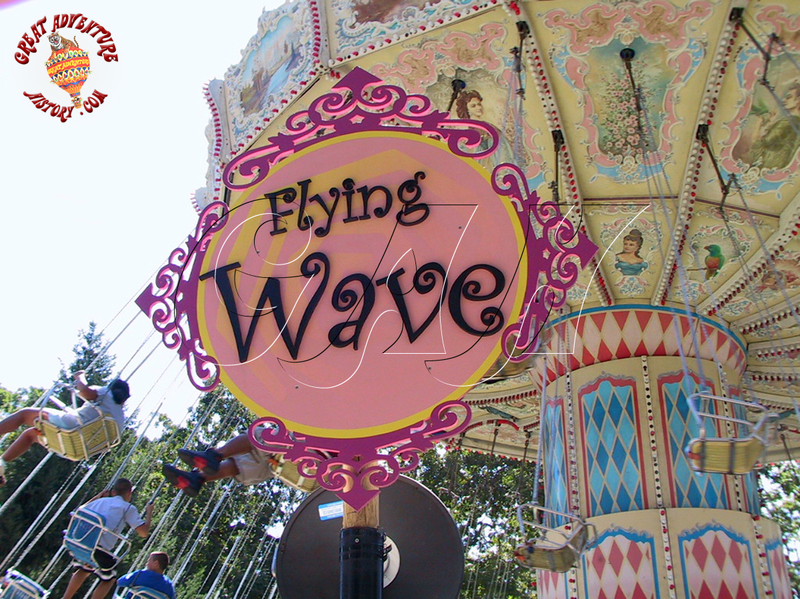 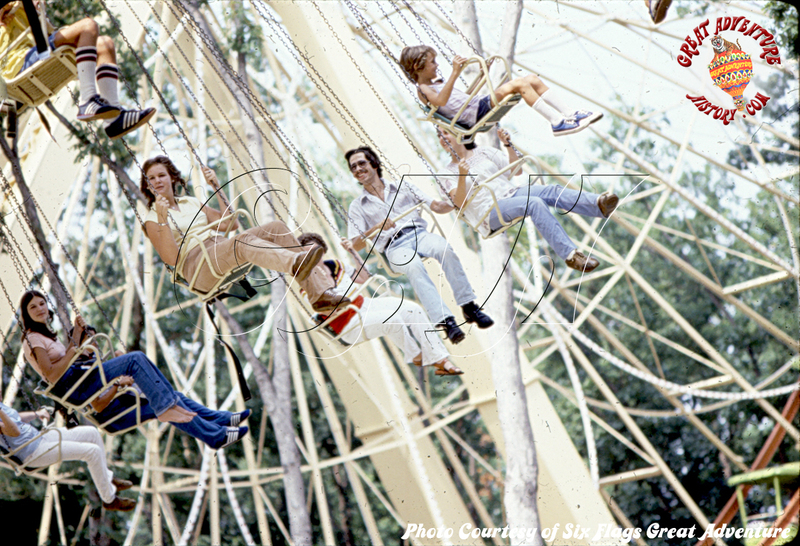 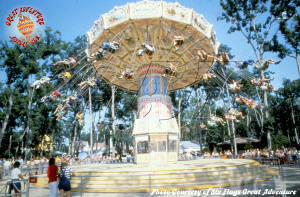 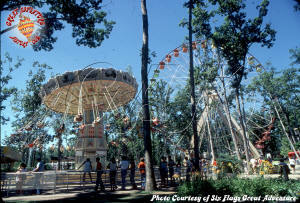 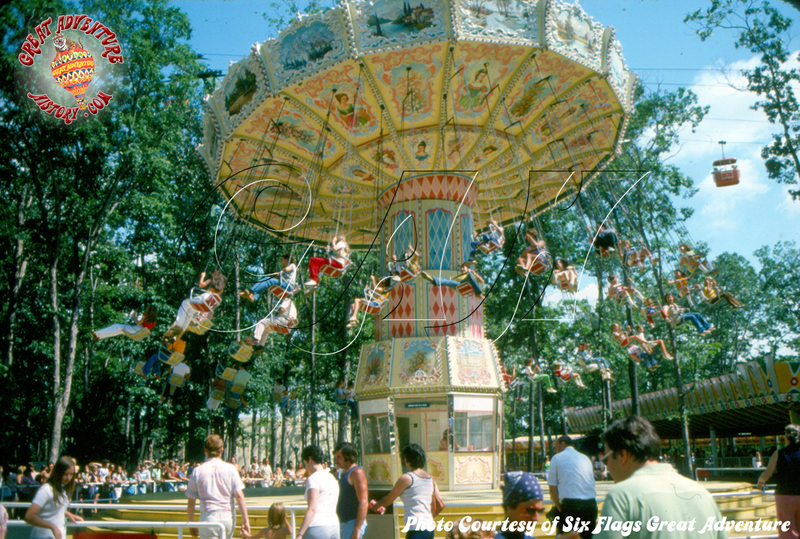 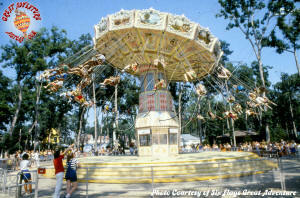 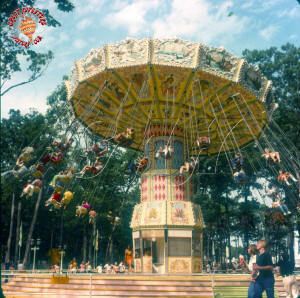 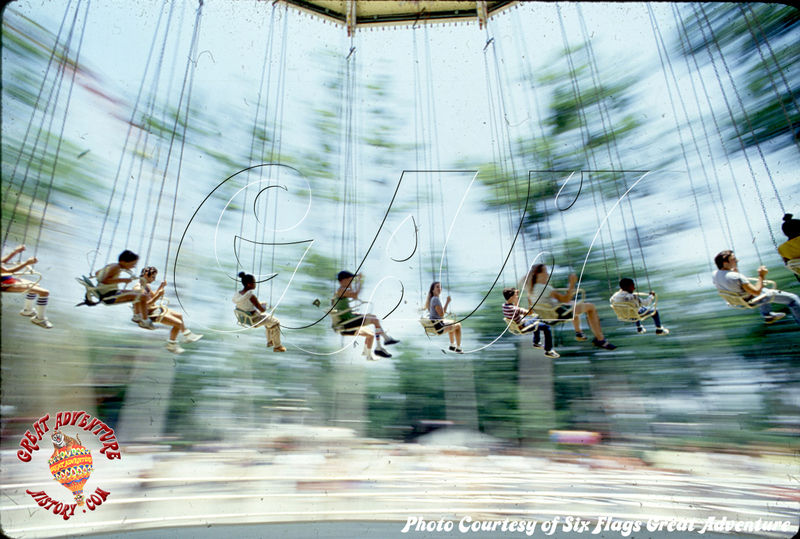 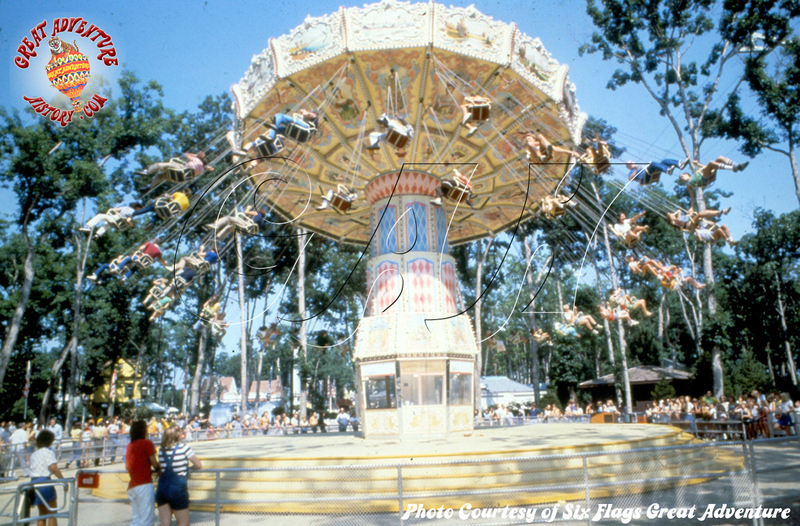 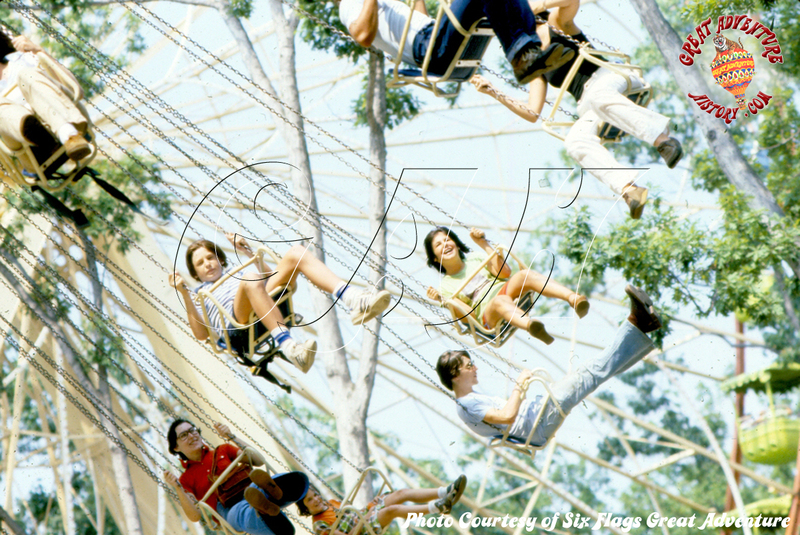 Opening as one of the park's original attractions in 1974, the Flying Wave was a staple for park visitors. 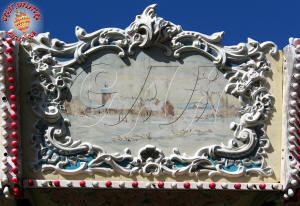 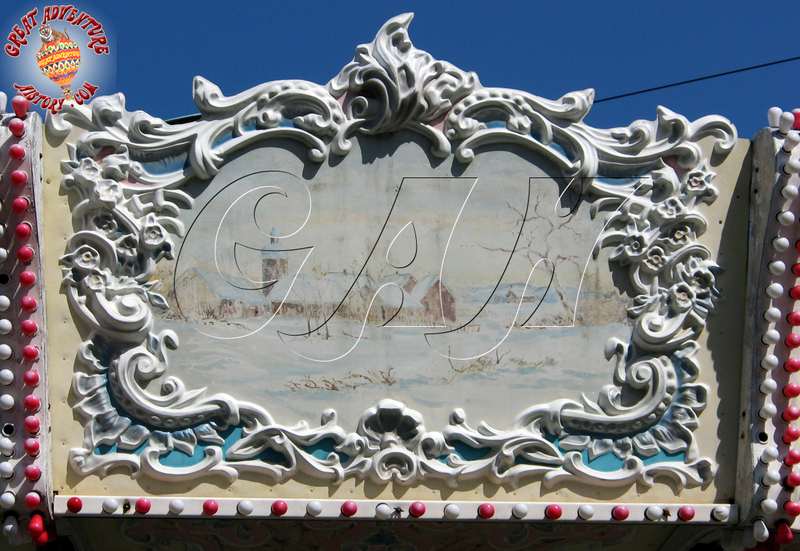 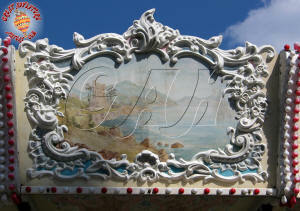 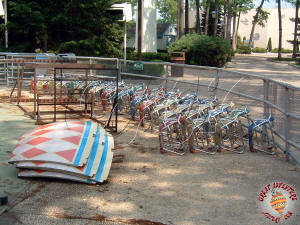 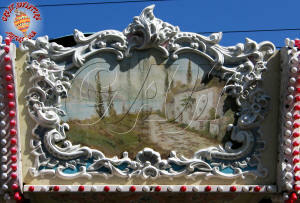 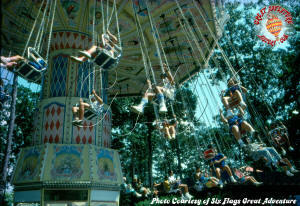 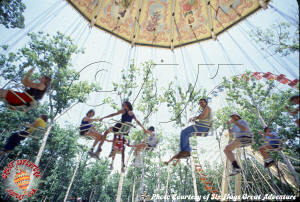 The rides appeal to families was timeless, and was a great way to cool off on a hot summer day. 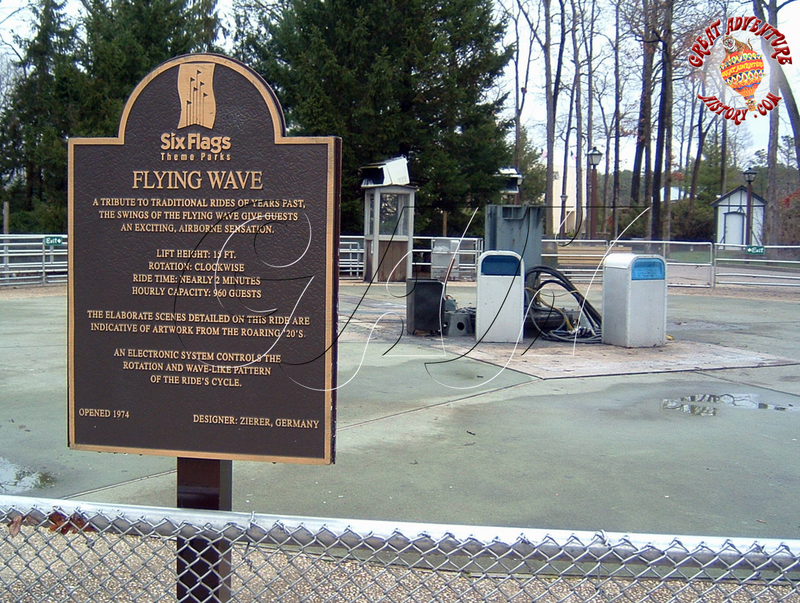 The original design of the Flying Wave had the operator's booth inside the tower. 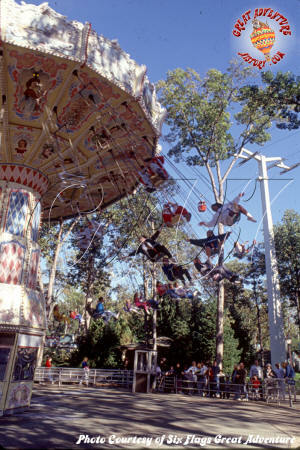 The operator stood inside the central plexiglas enclosure and even went outside the ride operator's booth while the ride was in motion. 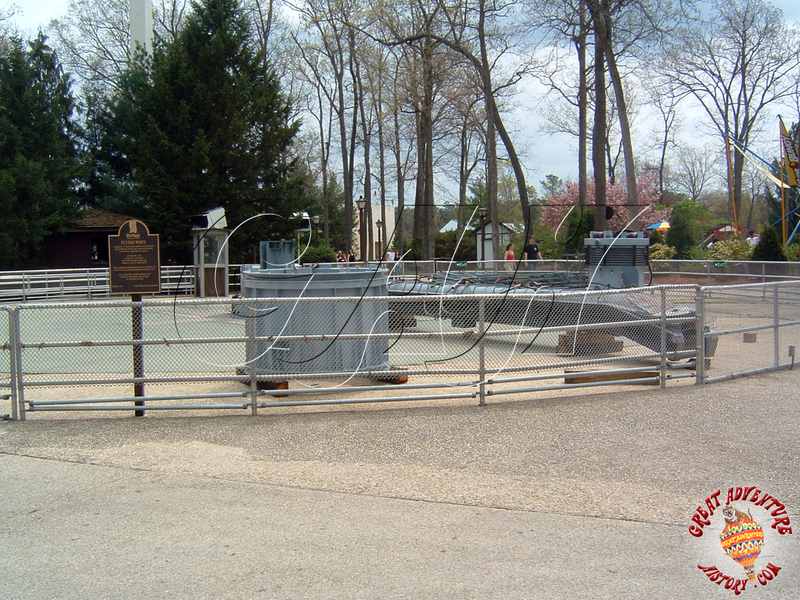 The original yellow metal steps at the base of the ride were removed for 1982, eliminating the short climb for guests up to the swings. 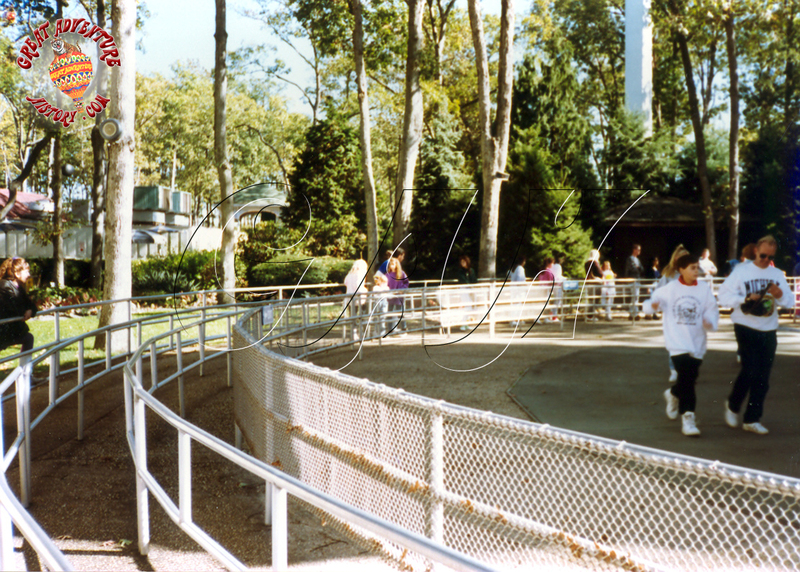 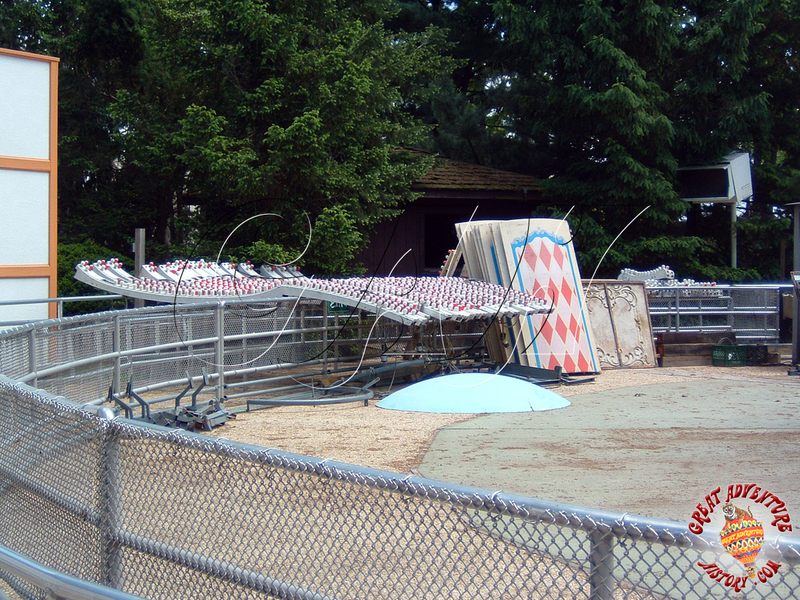 The ride was originally encircled by a simple fence around the ride platform, and the seats did not originally have safety belts. 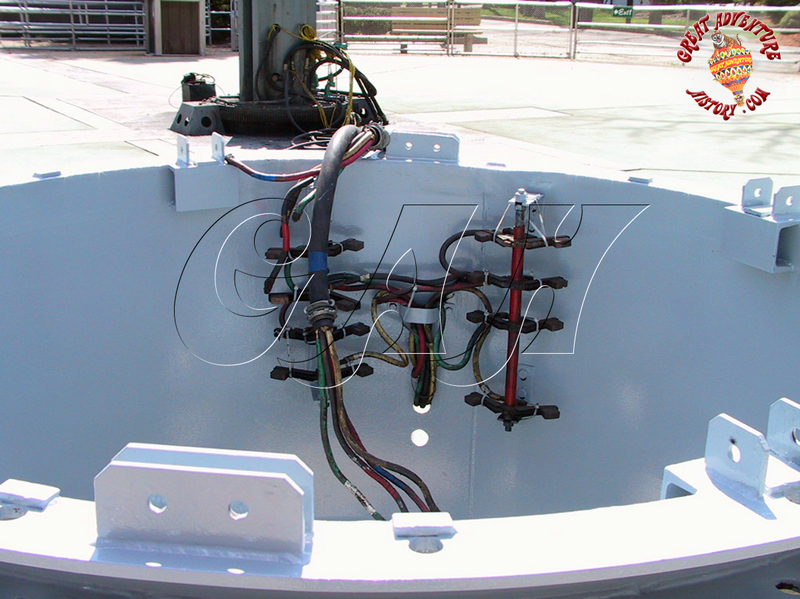 These modifications over the years improved the ride's safety for both the operators and guests. 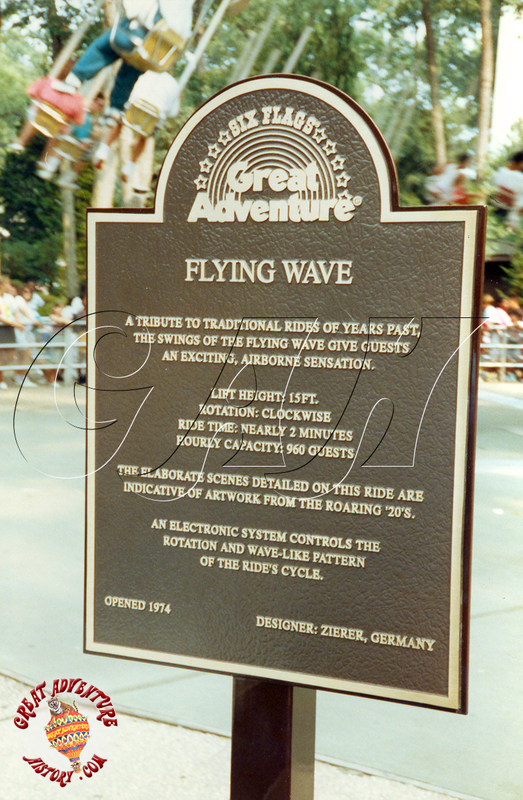 In the early years, the artwork on the Flying Wave was colorful and vivid. Over the decades the fiberglass panels weathered and soon appeared drab and faded. 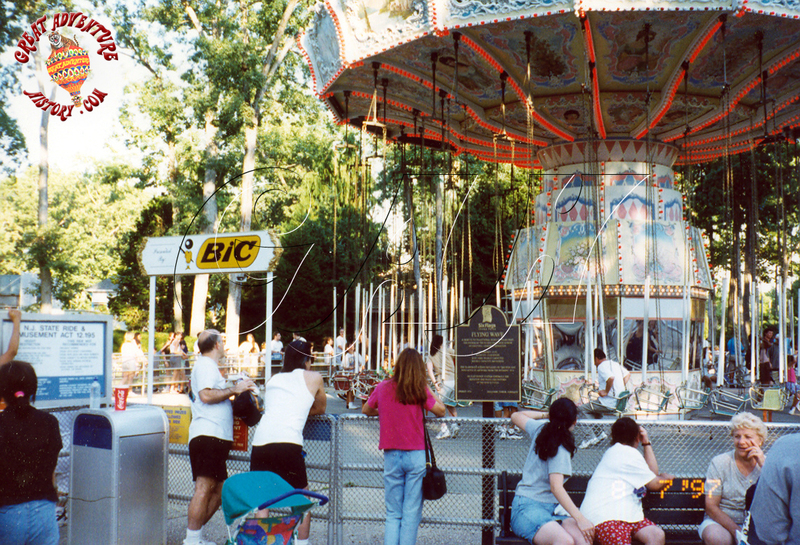 In 1997, for only one brief season, the ride was sponsored by Bic pens. 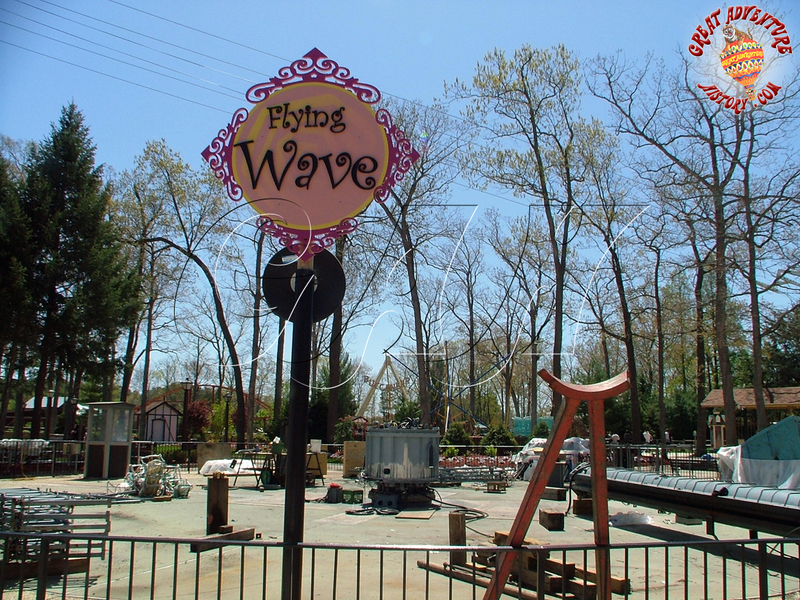 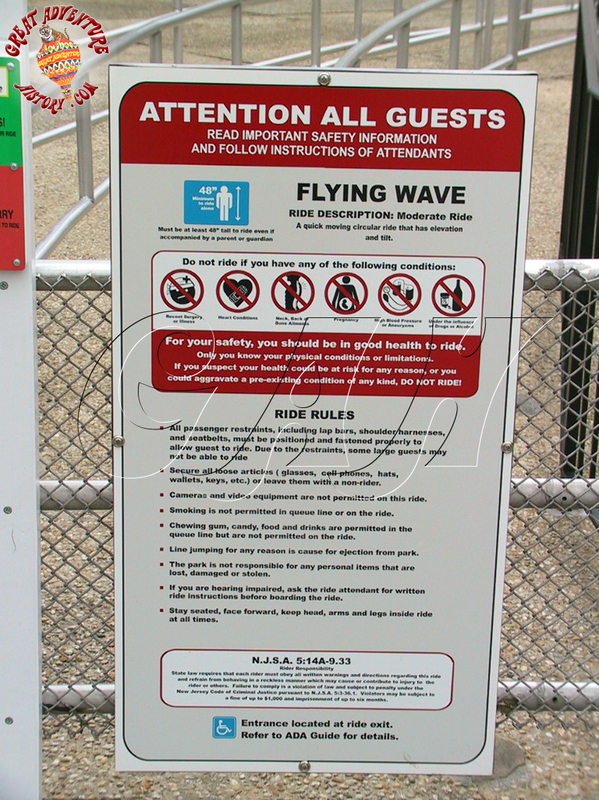 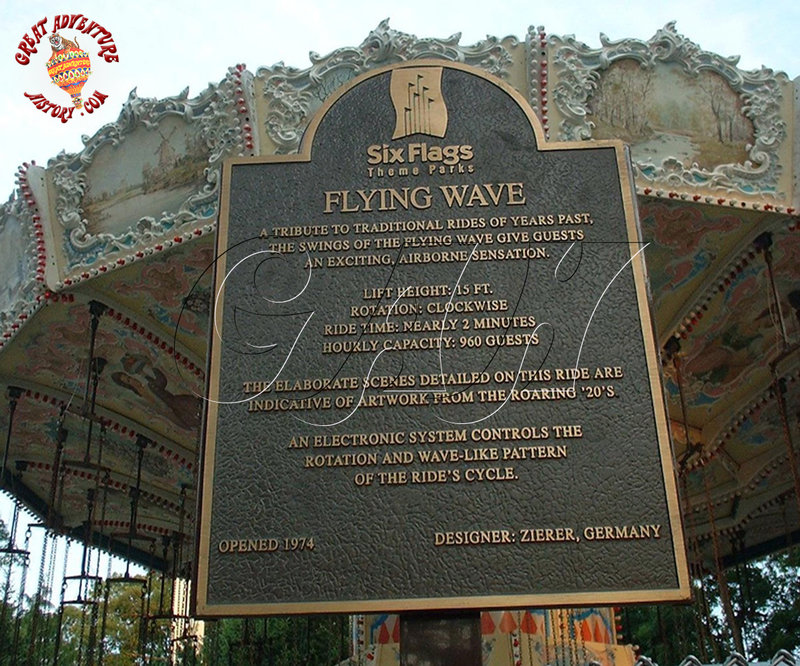 Even though the Flying Wave was a Great Adventure original attraction, it was one of the last rides to receive a decorative sign in 2005. 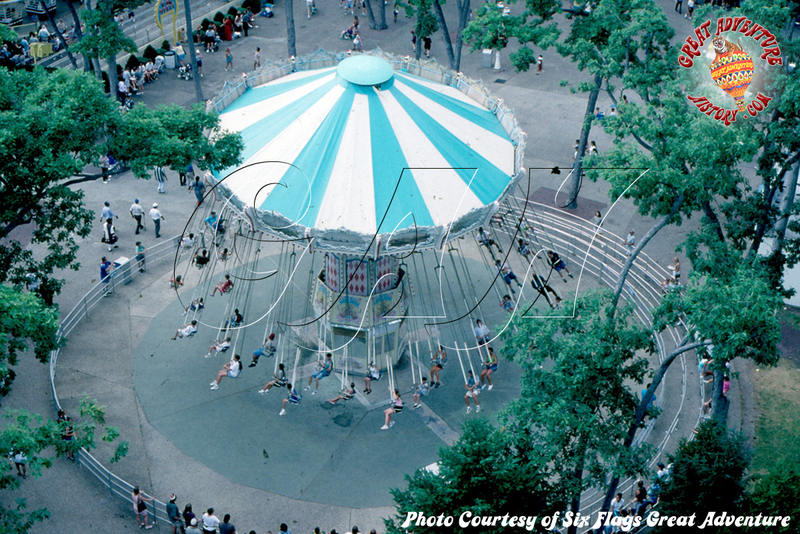 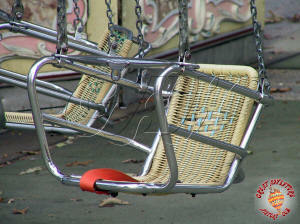 Most people up until that point had no idea what the ride was called and simply referred to it as "The Swings". 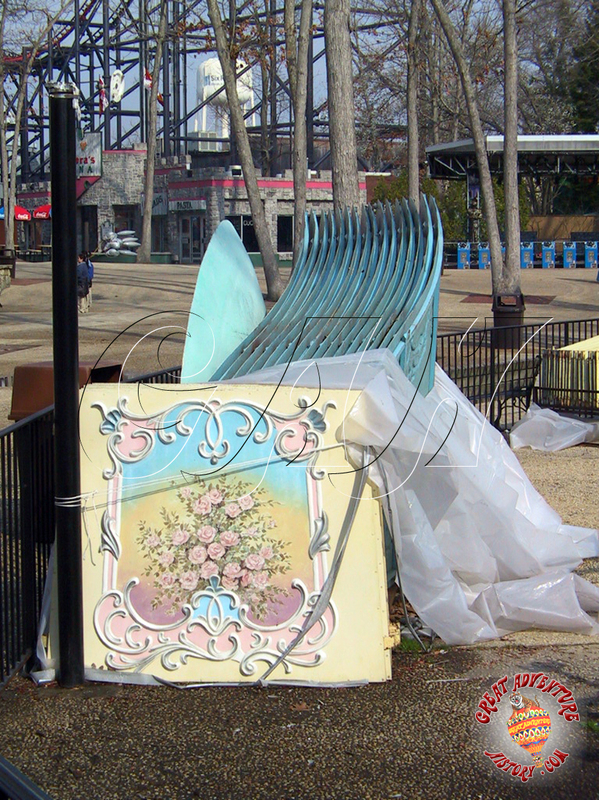 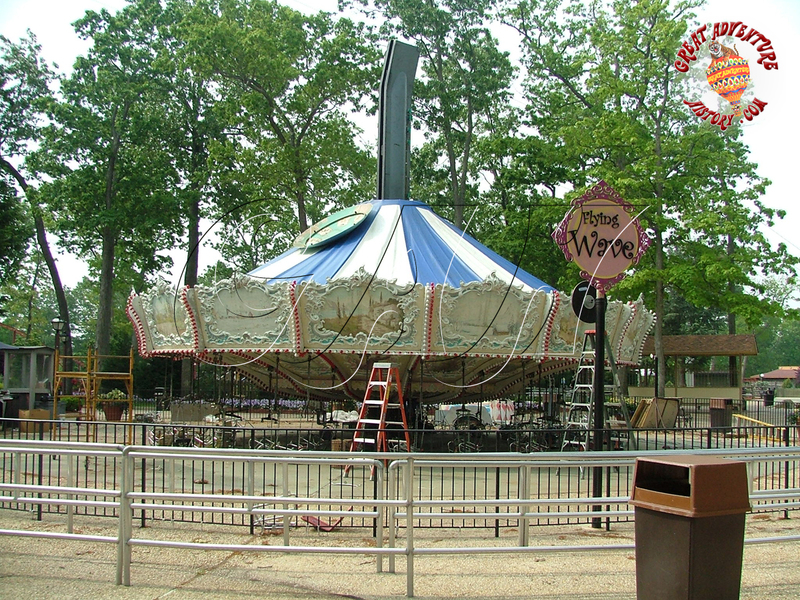 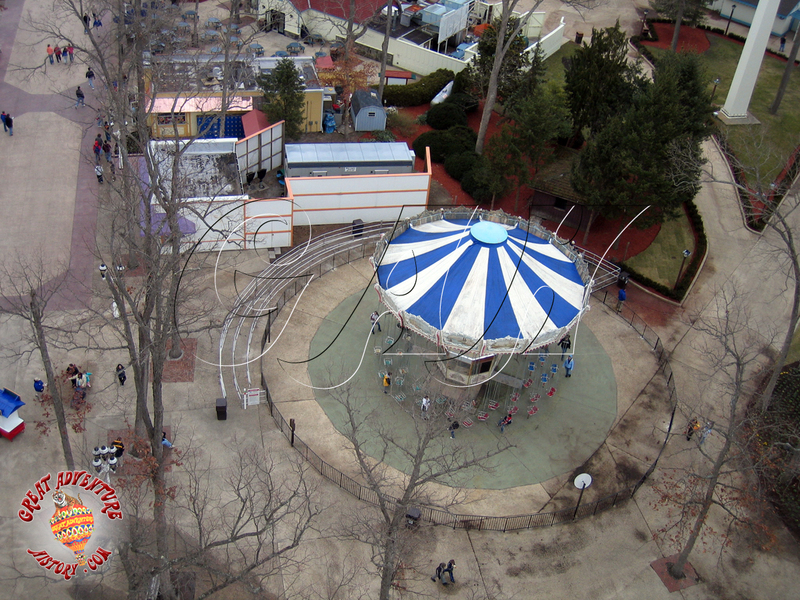 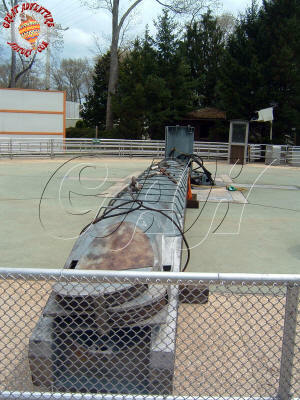 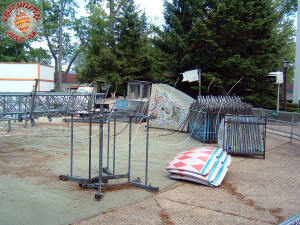 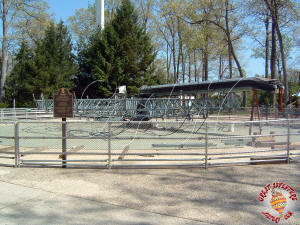 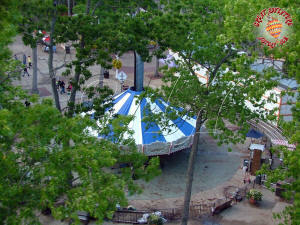 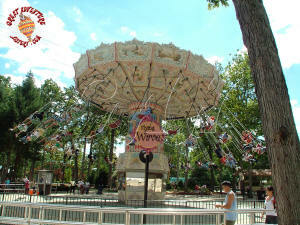 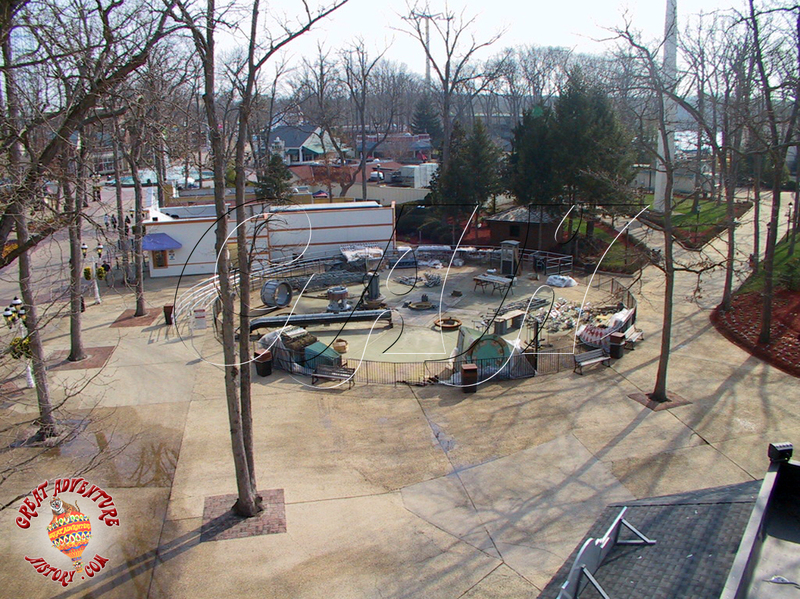 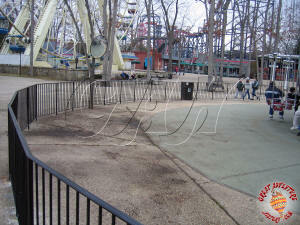 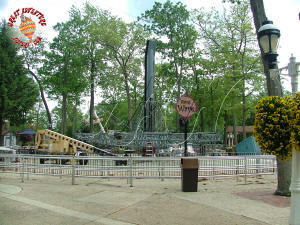 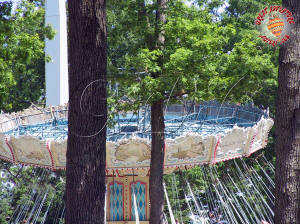 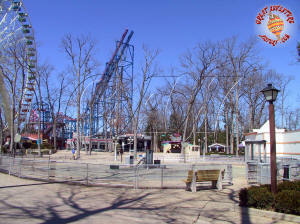 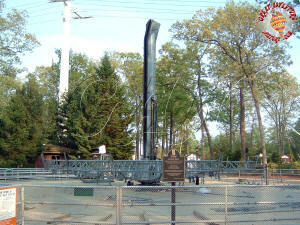 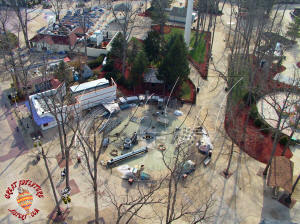 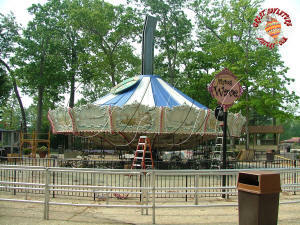 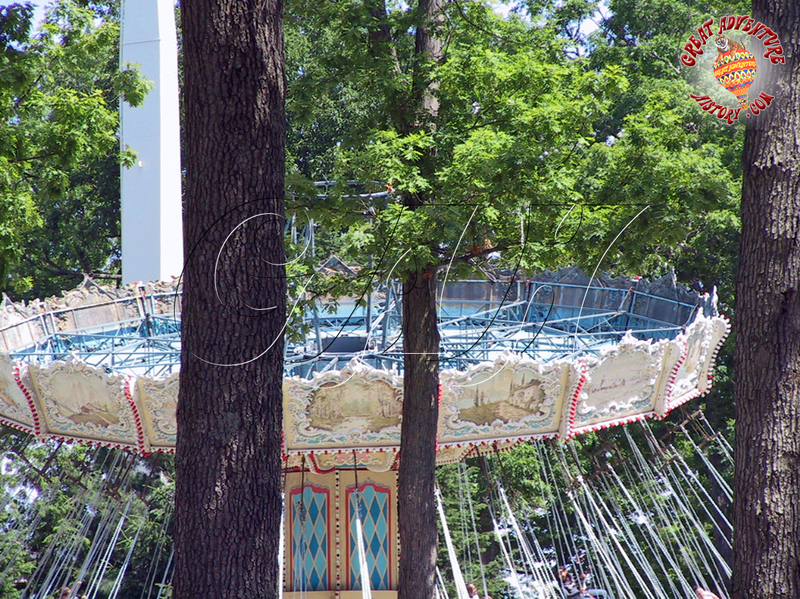 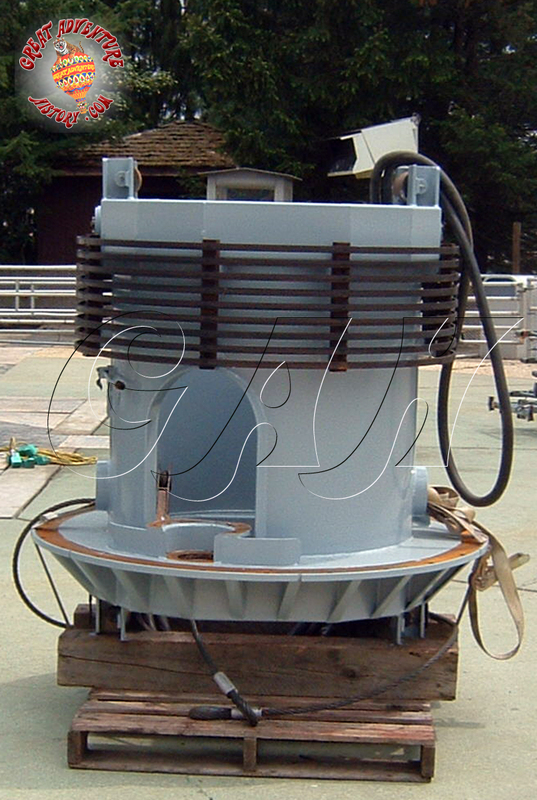 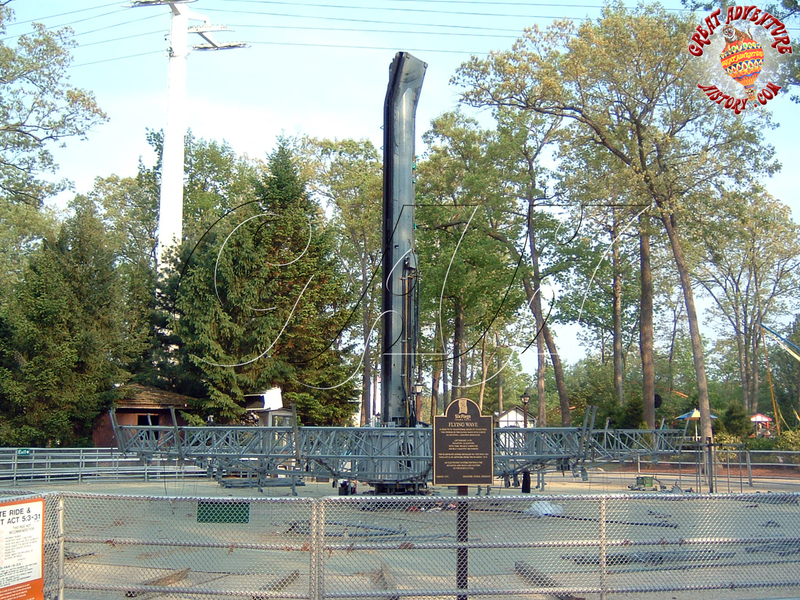 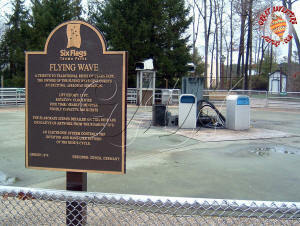 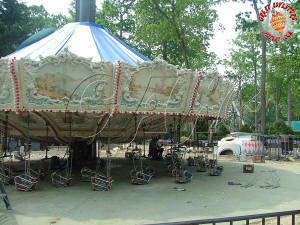 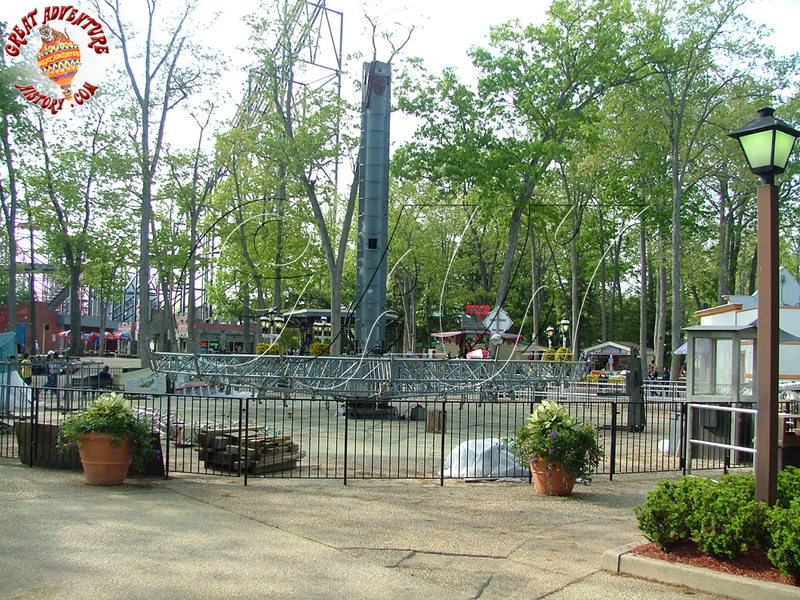 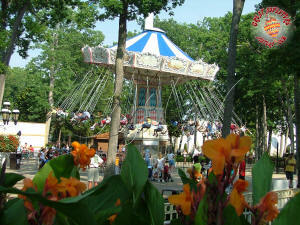 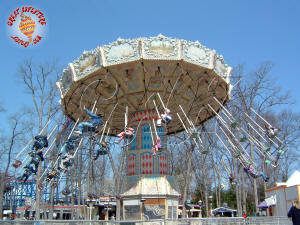 In the 2003-2004 off season, the Flying Wave was disassembled for a total overhaul. By opening day of the season it had not yet been reassembled. 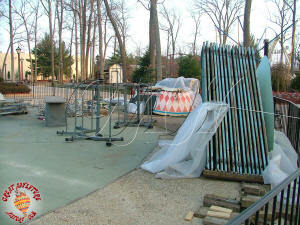 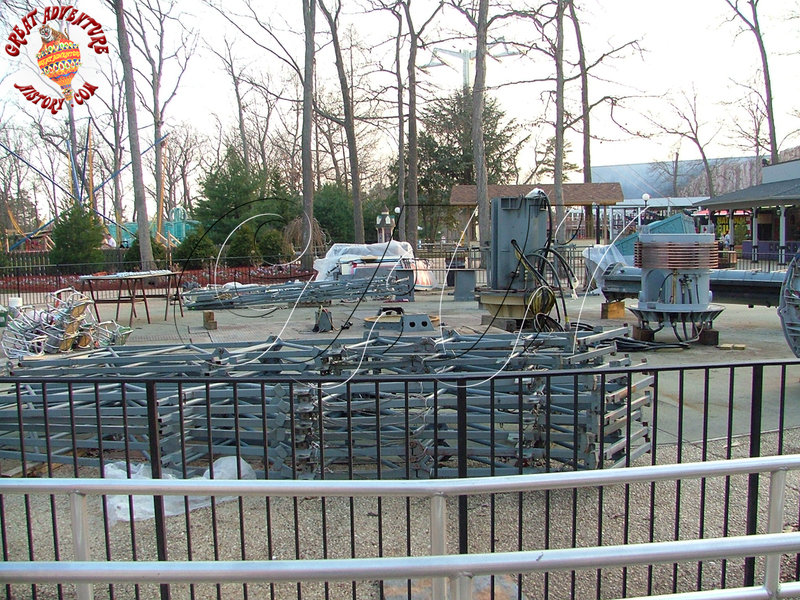 Over the following weekends of park operations guests could watch as the pieces of the ride were reassembled from the ground up. 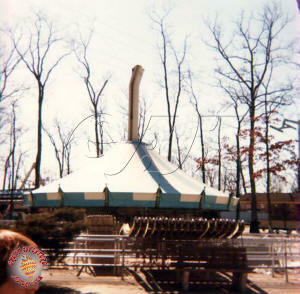 The ride's light tubular steel framework for the canopy was assembled first around the central hub. 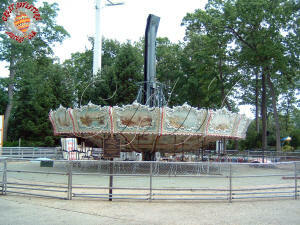 Once the framework was in place, the ride's center column was raised. 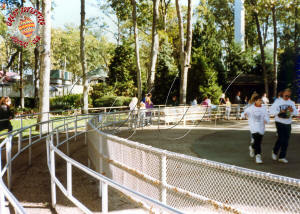 The ride's hub traveled up this column, lifted by cables and pulleys. 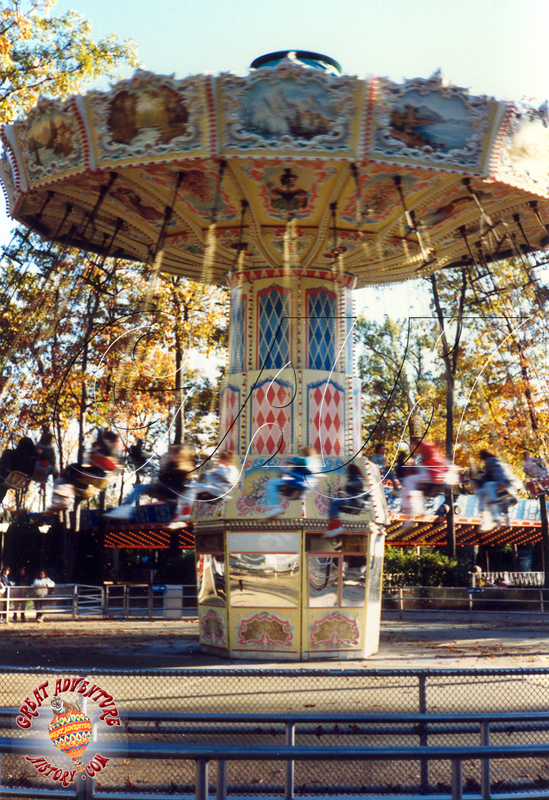 The tilt of the column at the top gave the ride its signature tilt and the rotation of the column in the opposite direction of the rotation of the canopy created the waves. 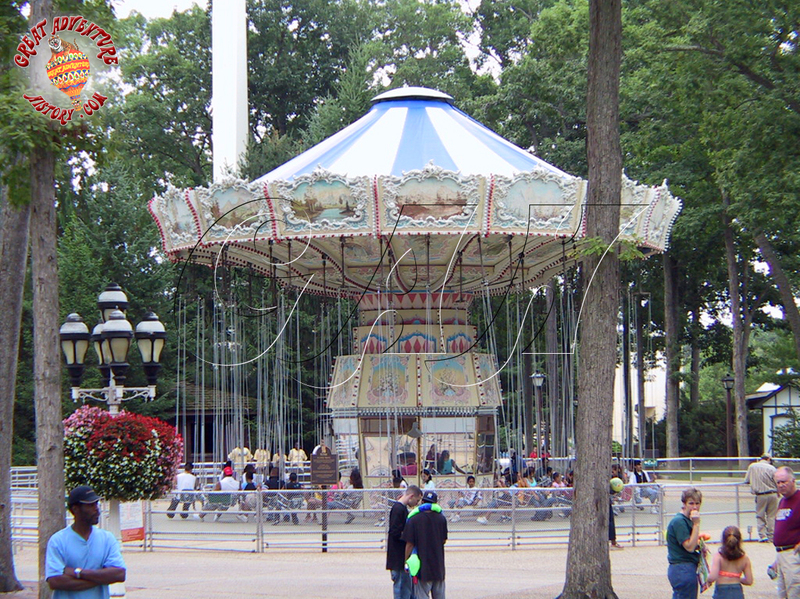 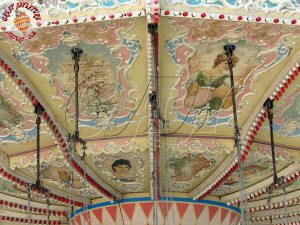 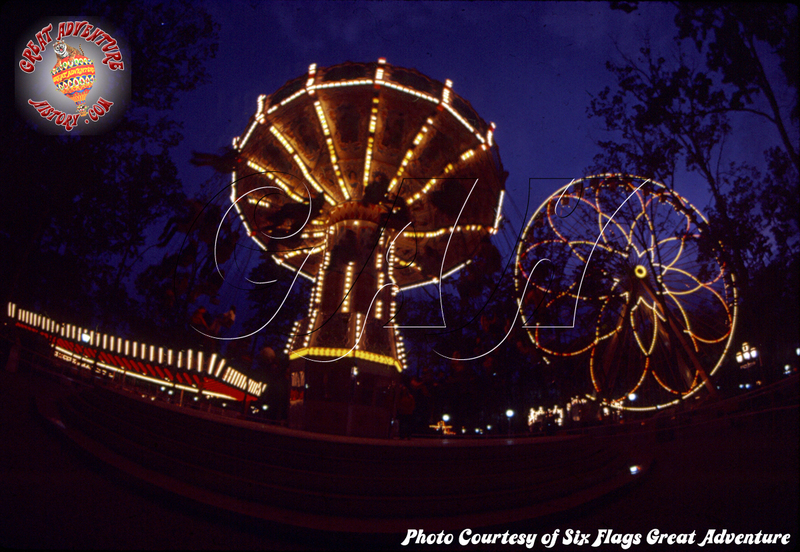 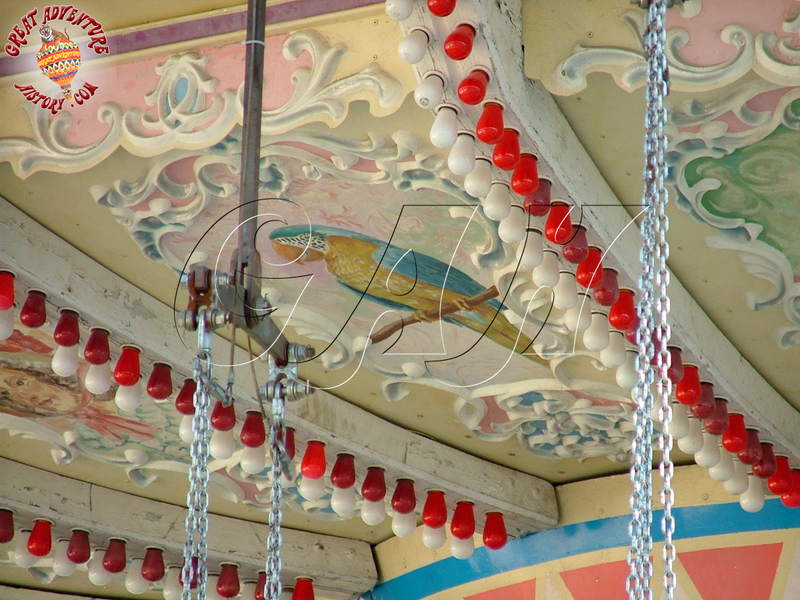 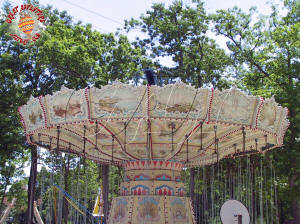 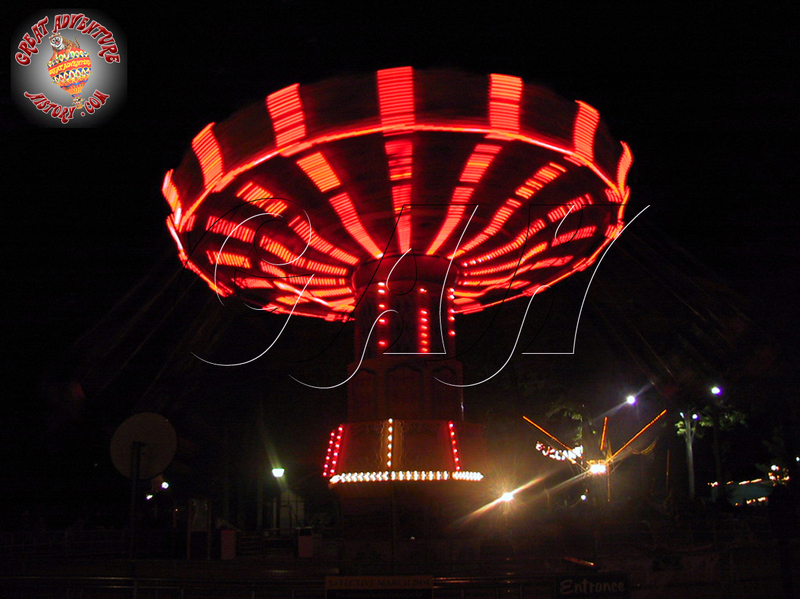 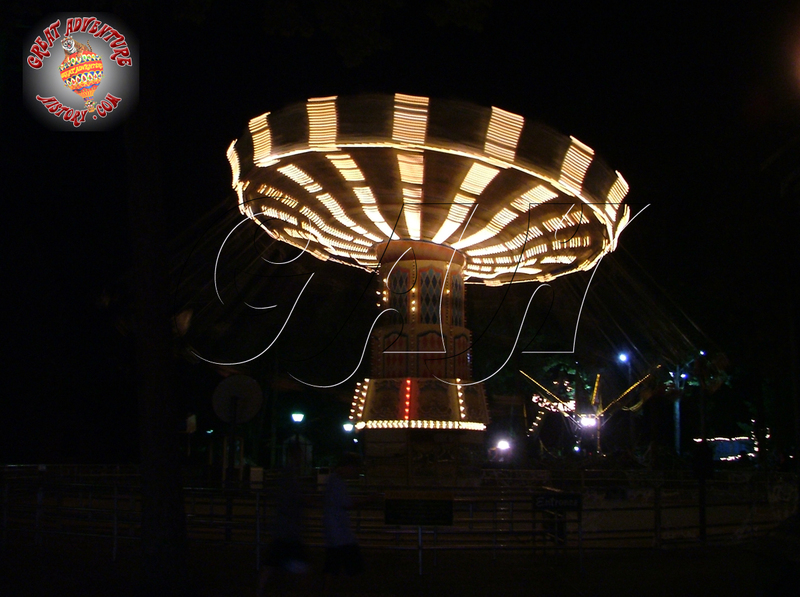 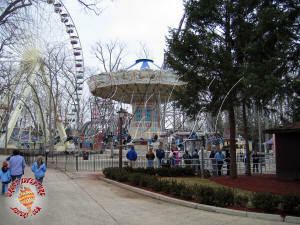 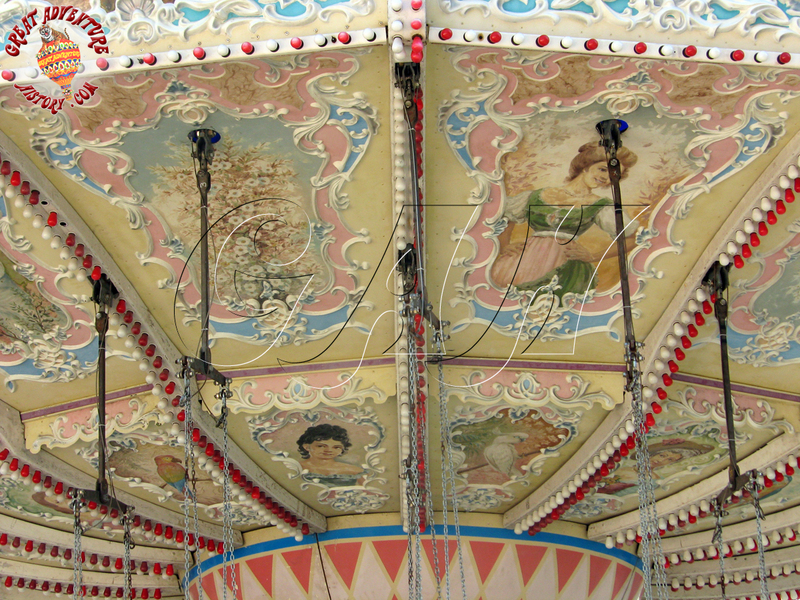 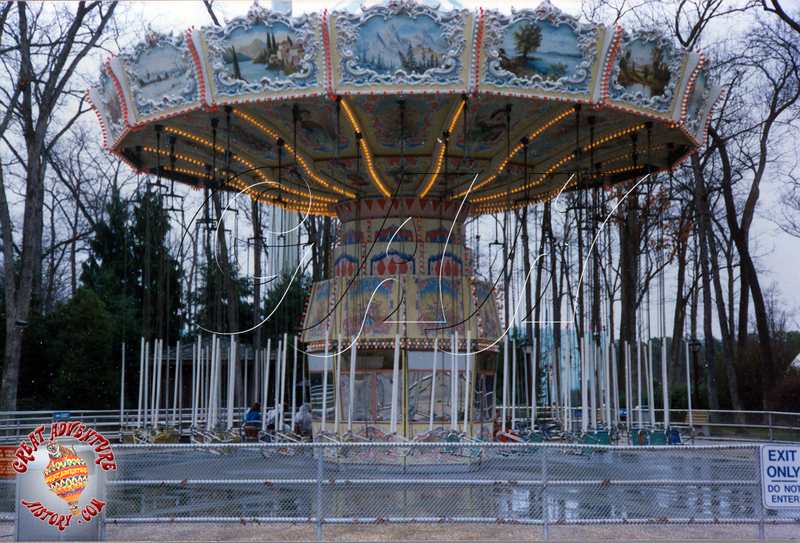 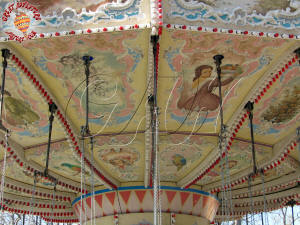 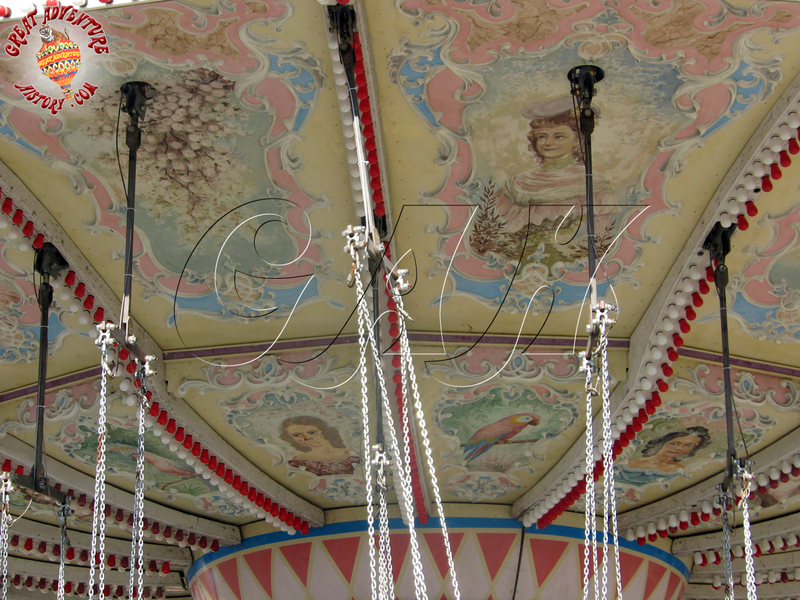 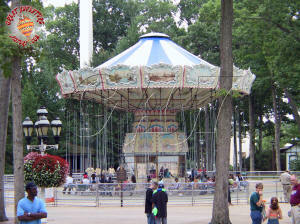 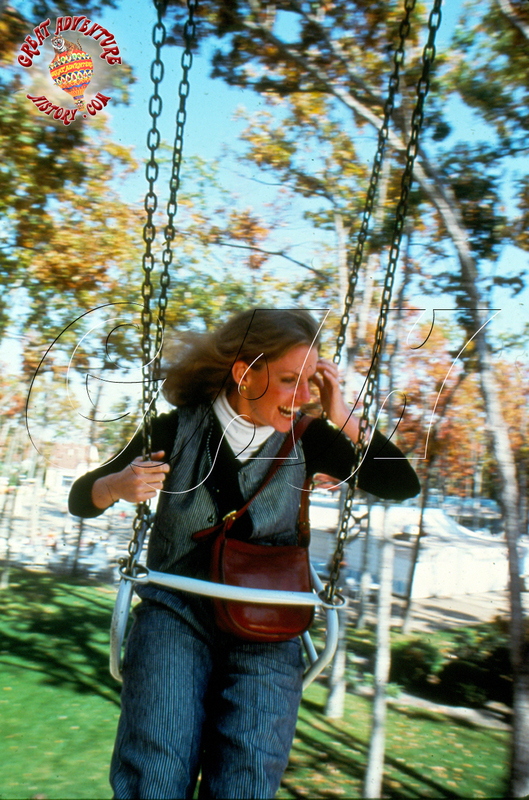 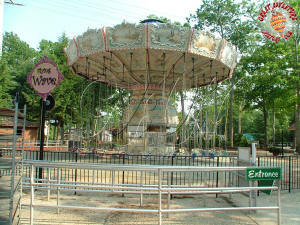 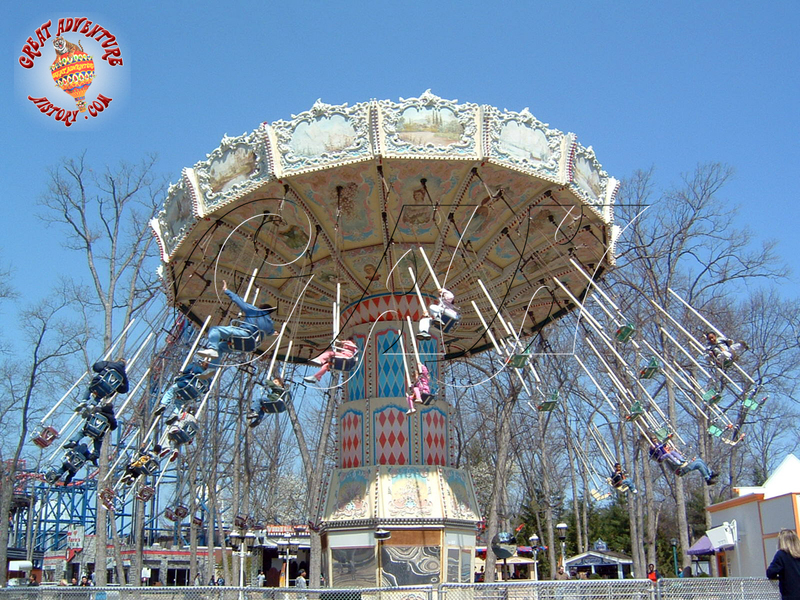 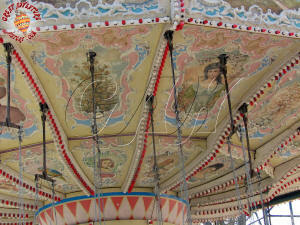 The swings themselves were reattached and the decorative fiberglass panels and lighting were secured to the frame before the canopy was hoisted into place. 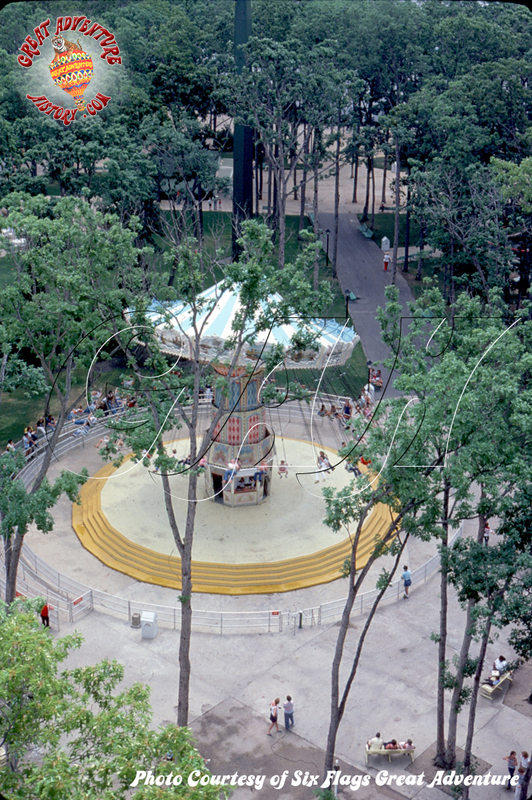 The ride reopened to the public without its decorative canvas roof in place, allowing a usually un-seen view of the central column and steel framework. 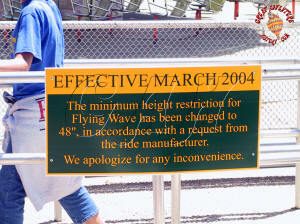 The 2005-2006 off season saw yet another major rehab of Flying Wave, with the ride being rebuilt from the ground up again. 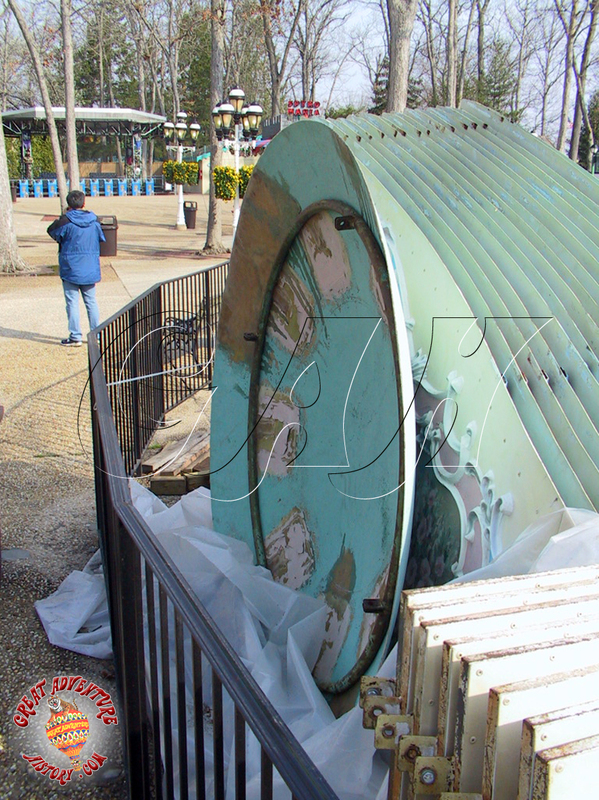 Once again it was not ready to open with the park, allowing guests a few weeks of watching the reassembly process as all the parts came together. A large gear would spin the central column, and a cylinder with copper bands would ride up the column supplying power for the ride's lighting. 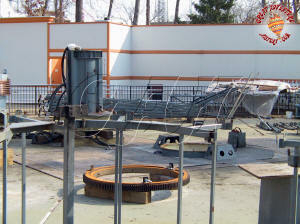 Much of the ride's mechanics were located in the central tower of the ride. 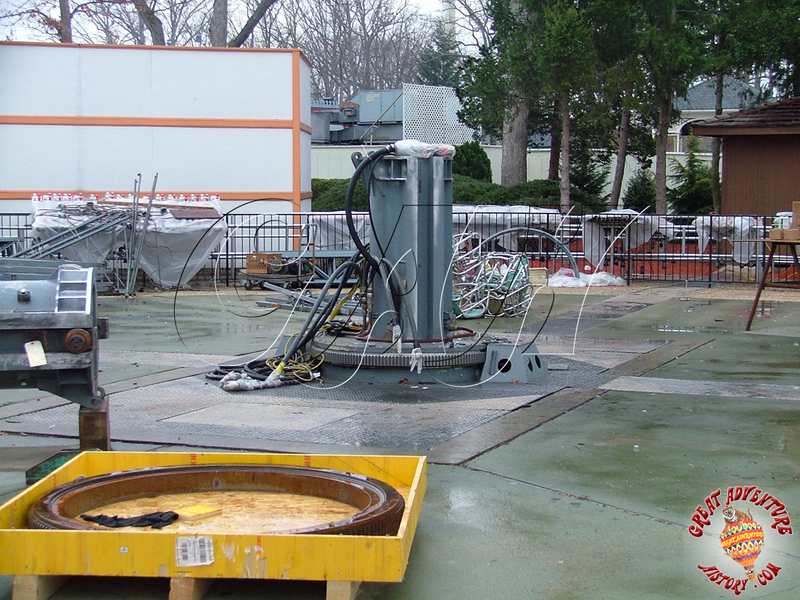 A small gray box coming up from the ground was where the drive gear met up with the drive shaft which was under the metal covering in the ground. 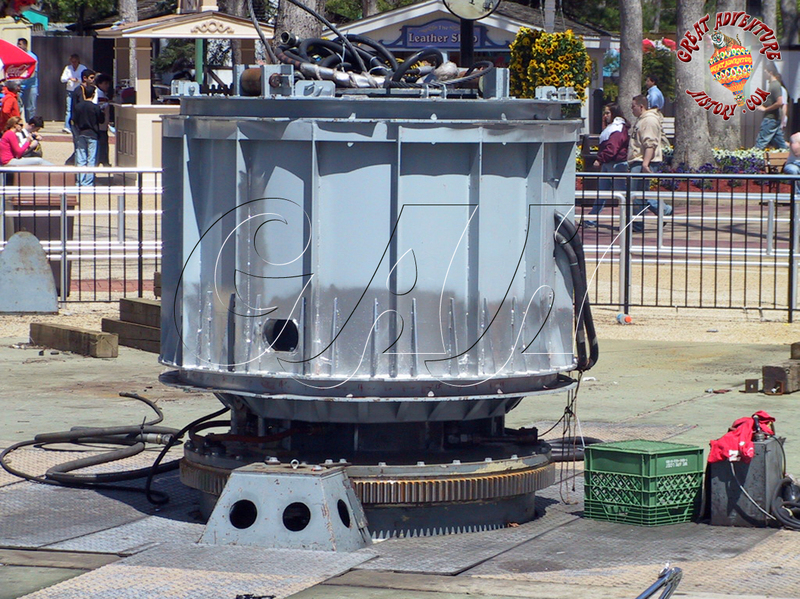 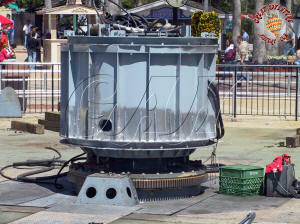 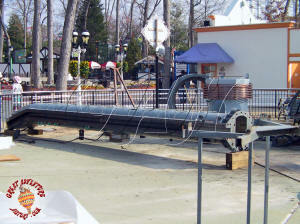 The ride's drive motor was in a small building behind the Operator's booth. The drive shaft was inside a long covered trench that joined the ride and the motor house. 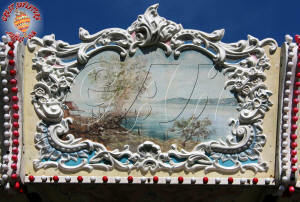 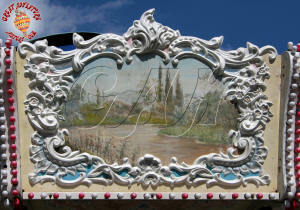 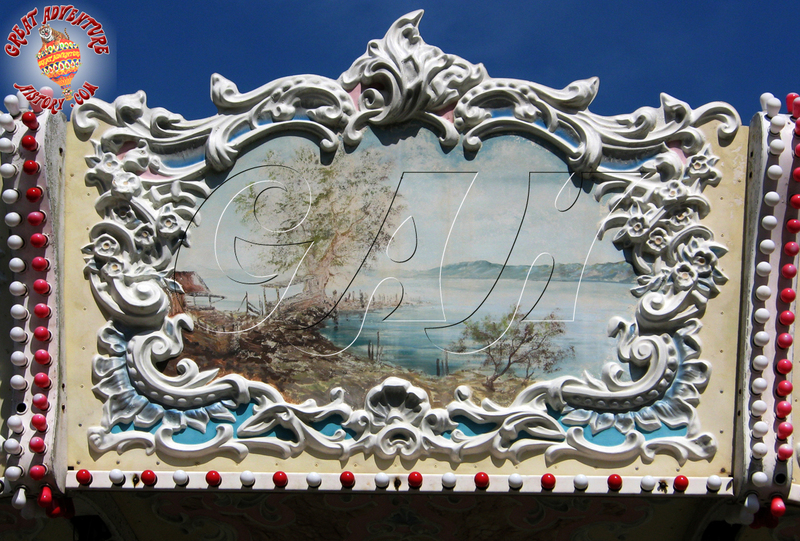 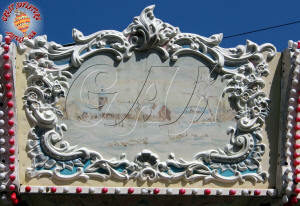 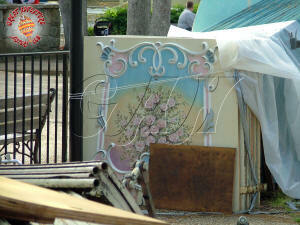 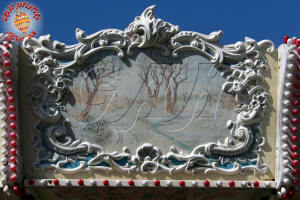 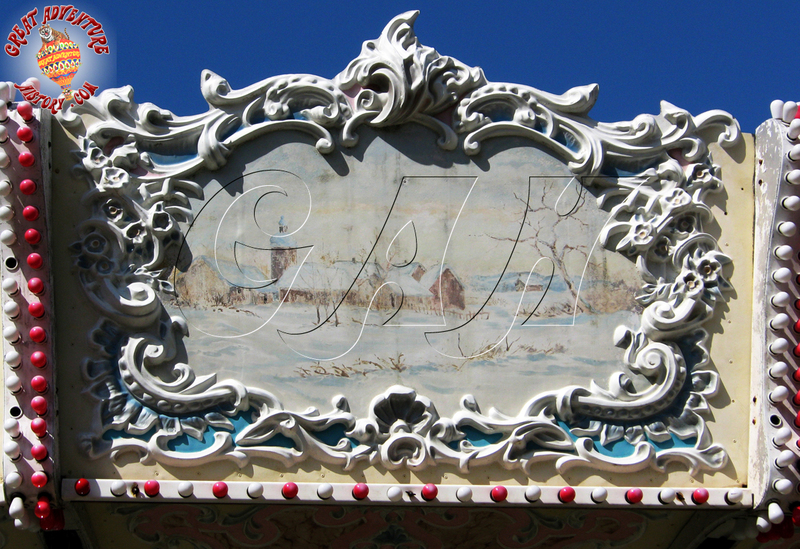 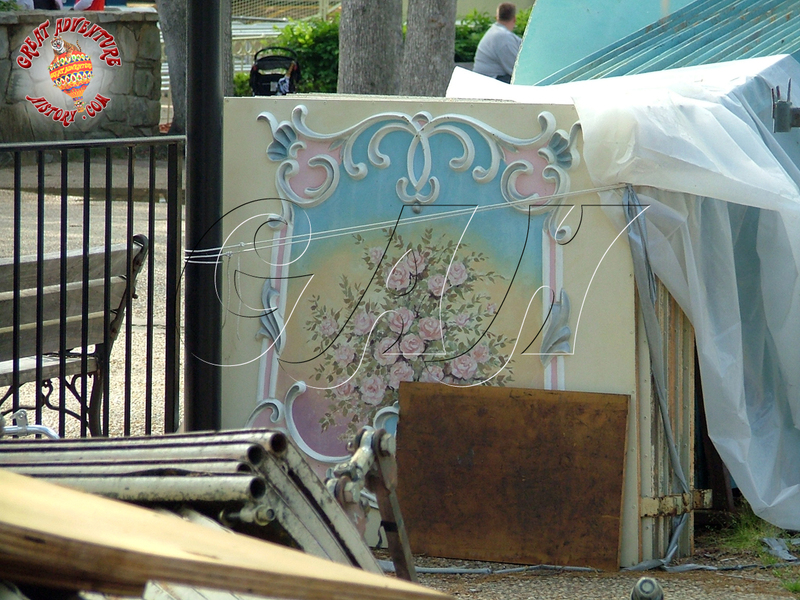 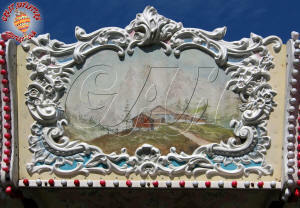 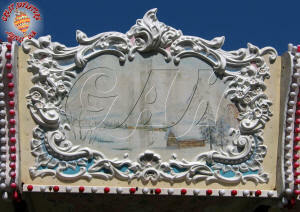 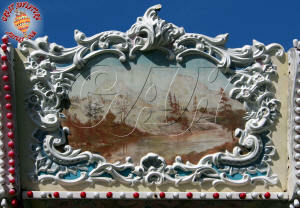 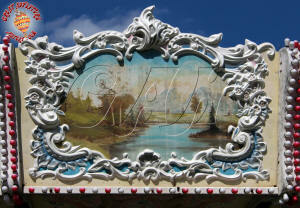 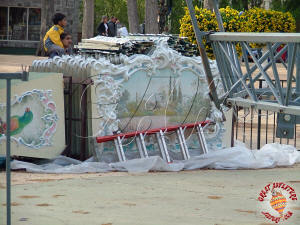 The fiberglass panels featured molded scrollwork decorations framing the hand painted flowers and portraits. 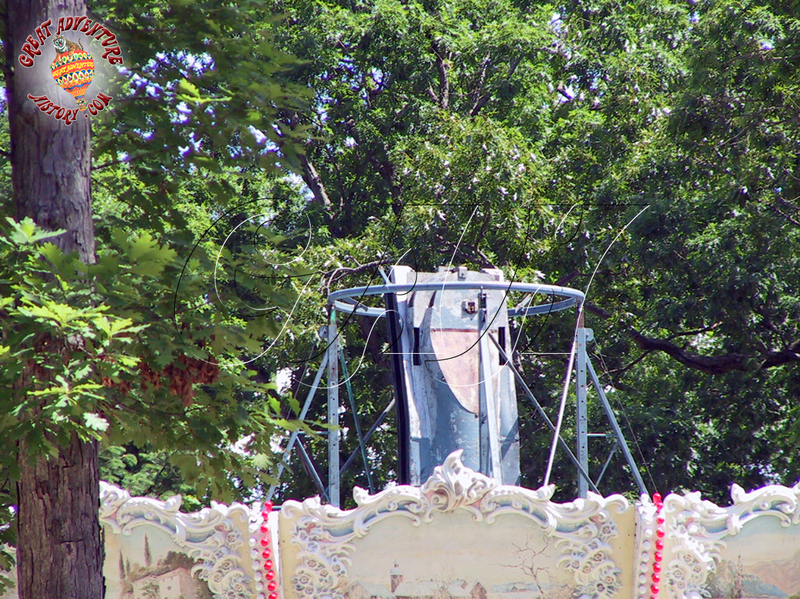 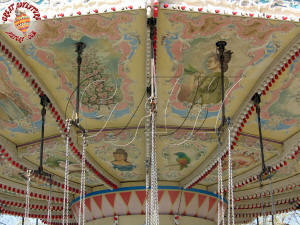 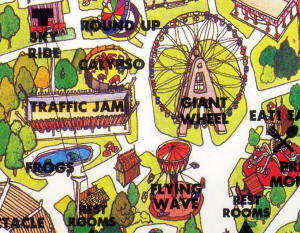 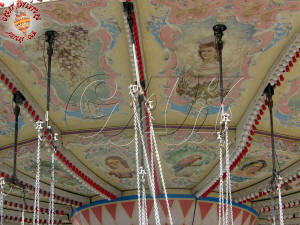 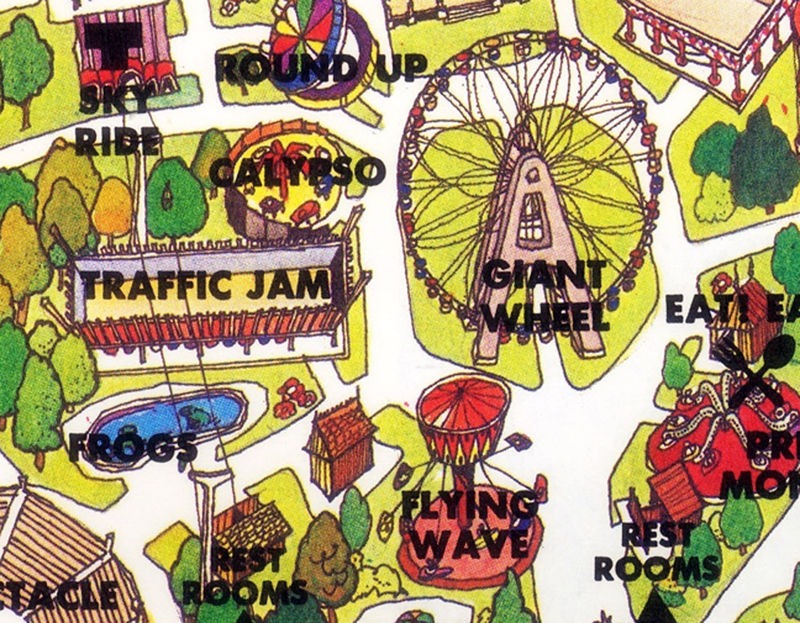 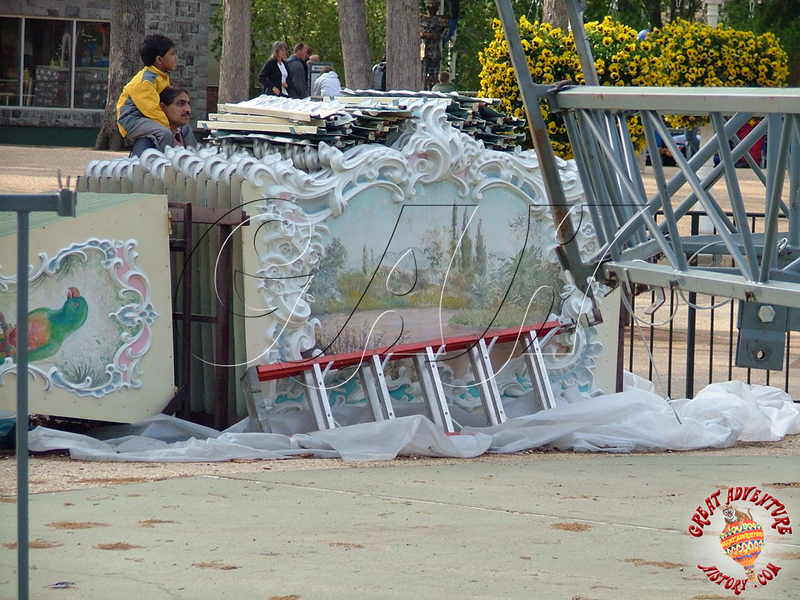 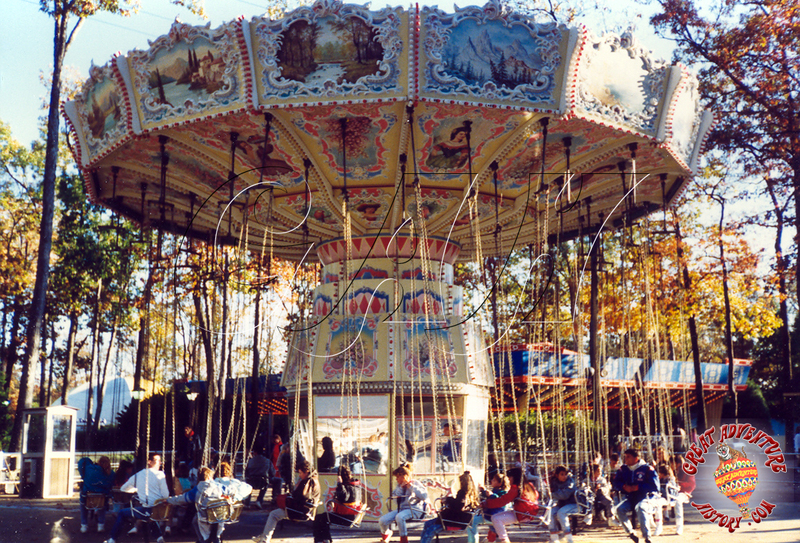 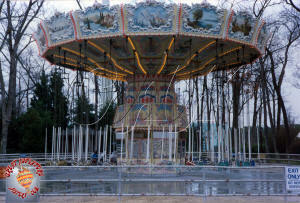 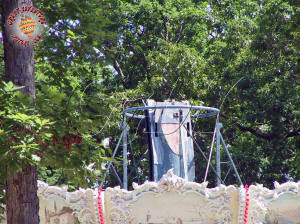 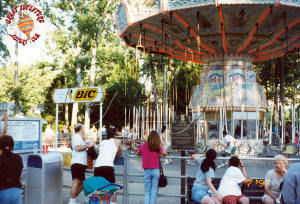 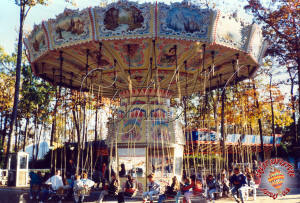 The ride was originally designed for portability and easy of assembly on the European fair circuits. 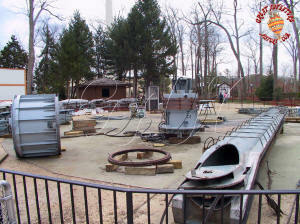 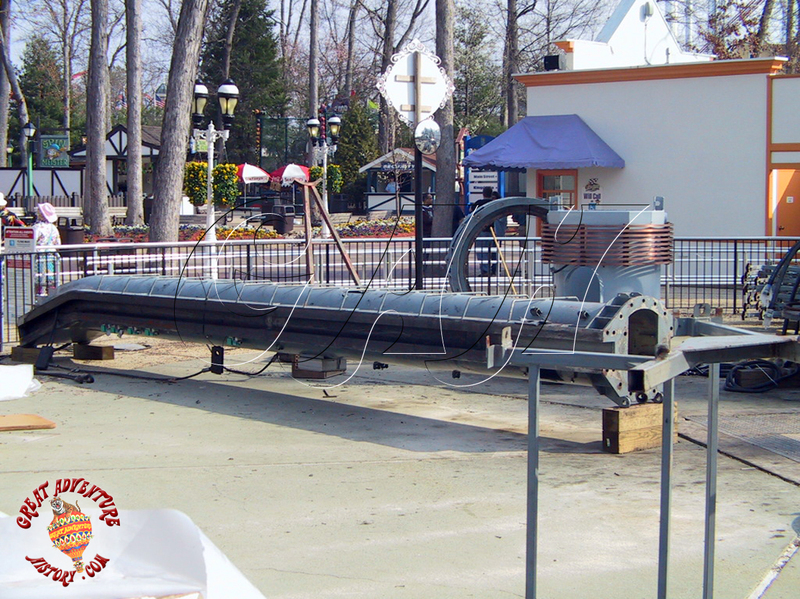 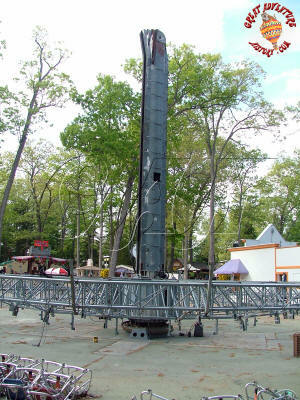 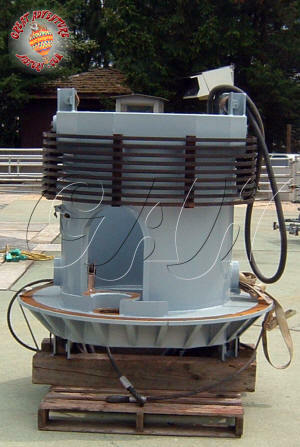 Great Adventure's model was modified for park use with the relocation of the drive motor from the base platform to a remote building. The Flying Wave at night was a spectacular sight with its hundreds of lights changing from white to red as it spun. During its final years several minor changes occurred for the Flying Wave with the replacement of the light blue canvas roof with a new darker blue version. 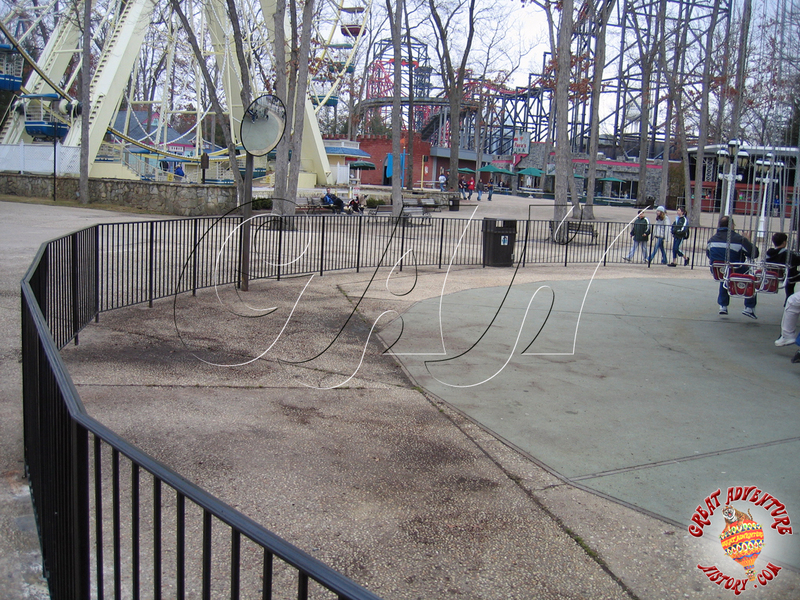 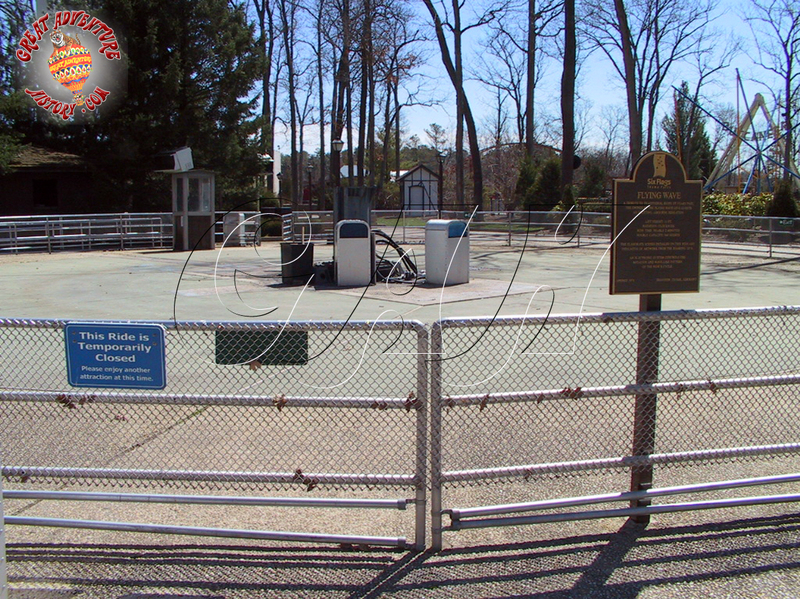 In addition, the old aluminum perimeter fence was replaced with a new black wrought iron fence. 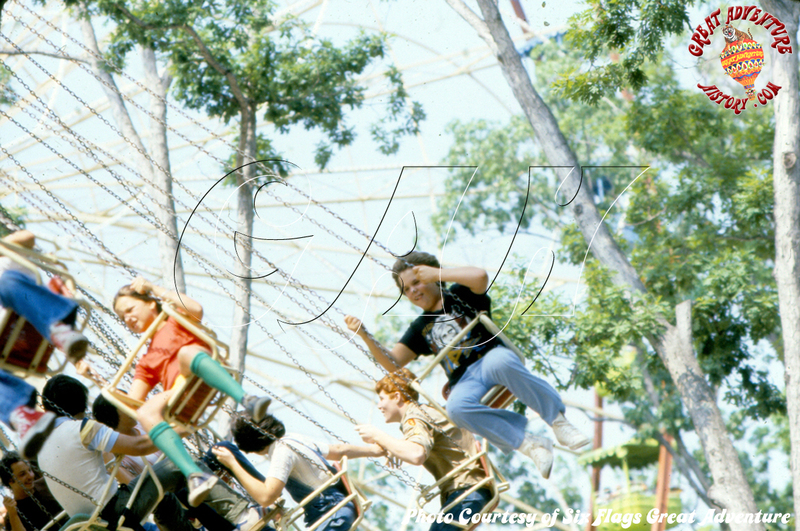 Over the years the orange safety belts were added to the seats. 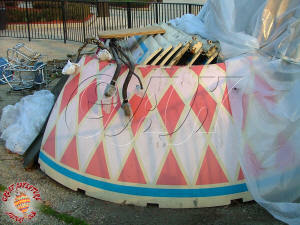 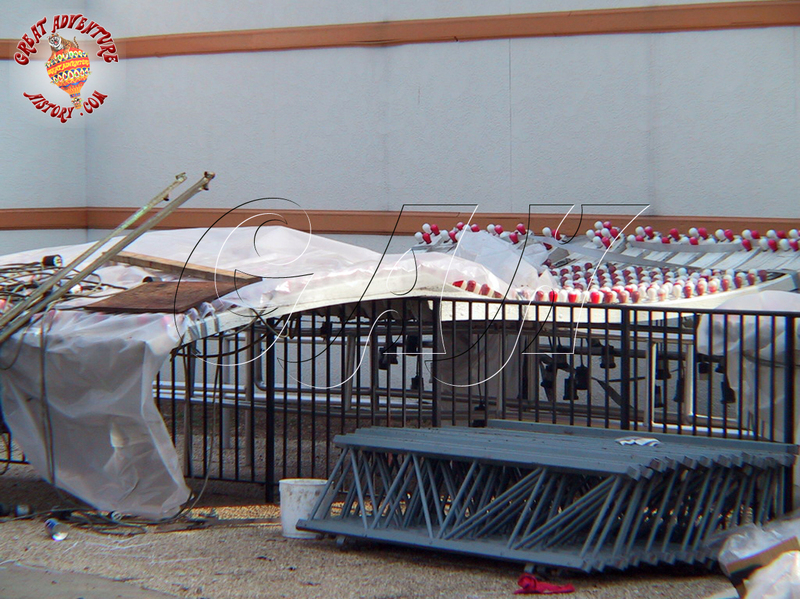 The colorful synthetic wicker was replaced several times as it wore out and faded. 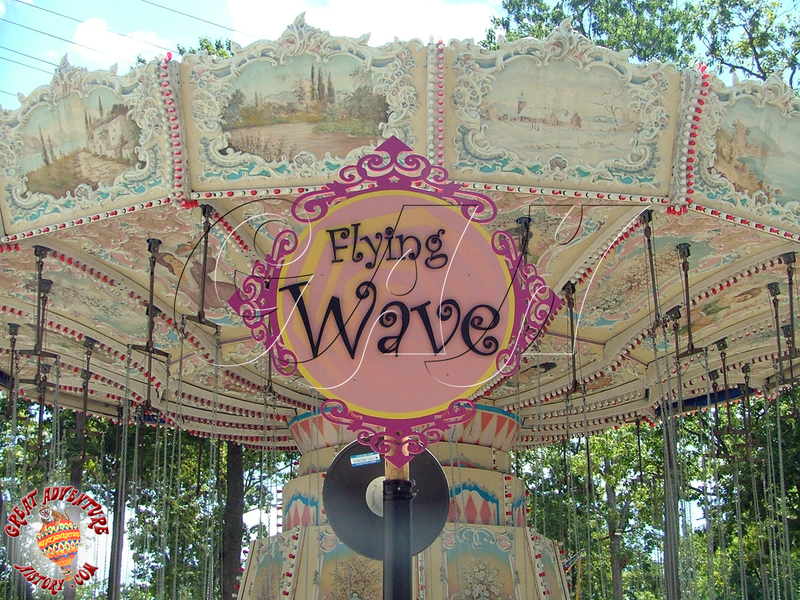 Even though the intricate paintings of Flying Wave's panels faded with time, the ride was still as popular as ever delighting the park's guests of all ages. 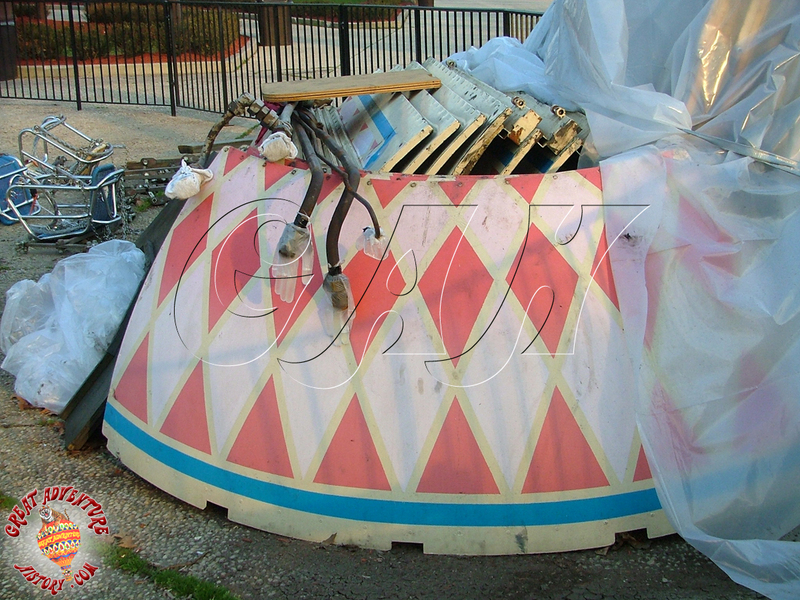 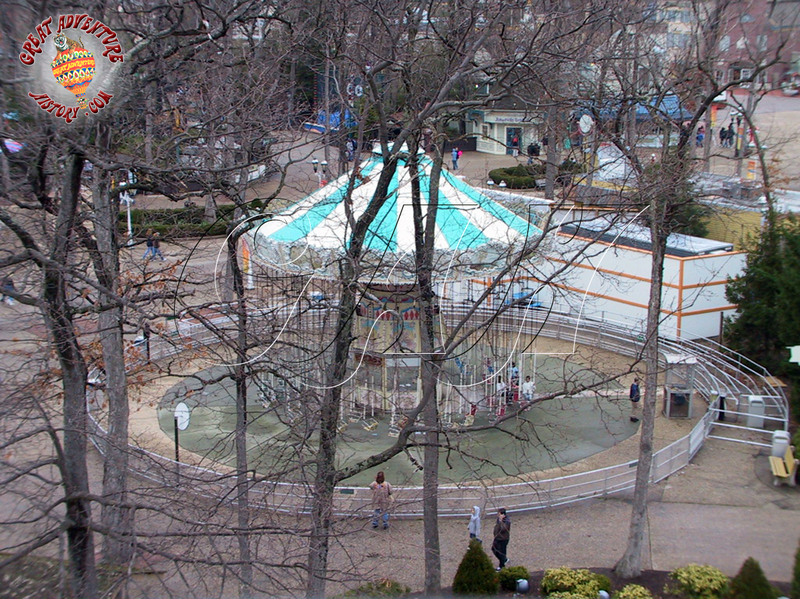 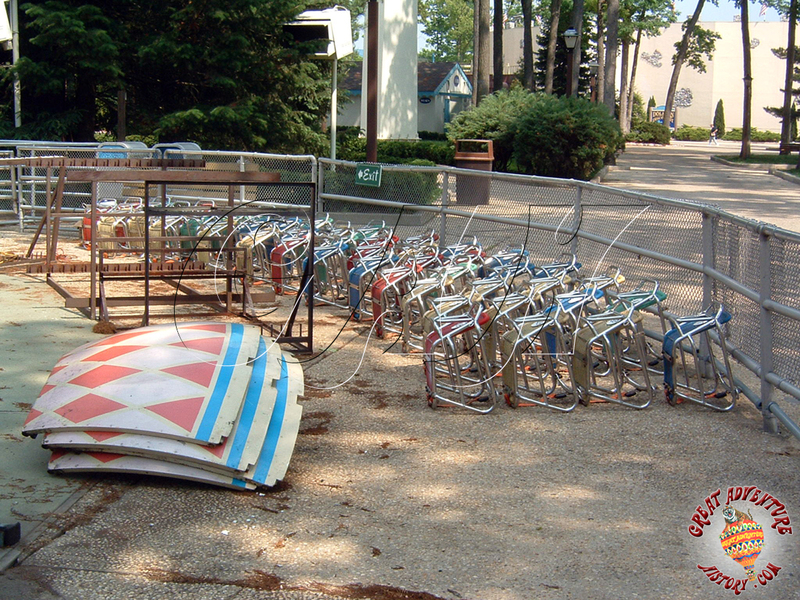 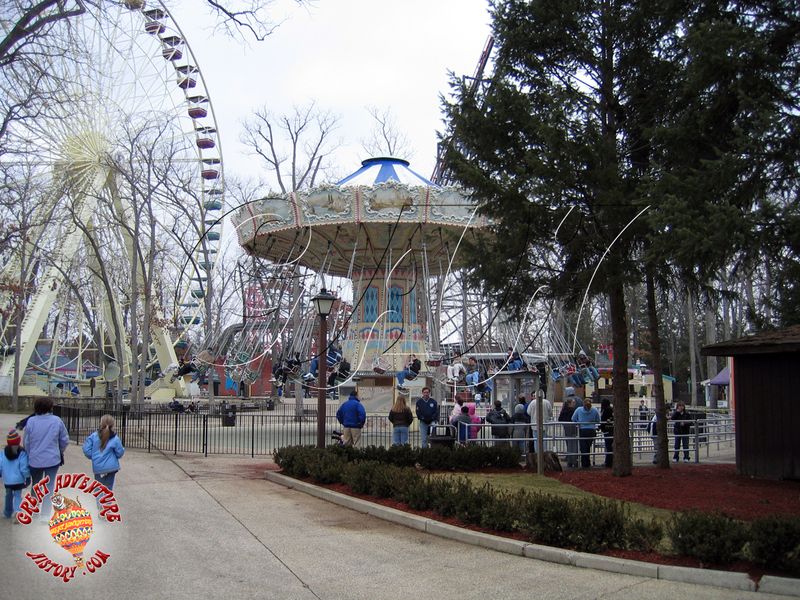 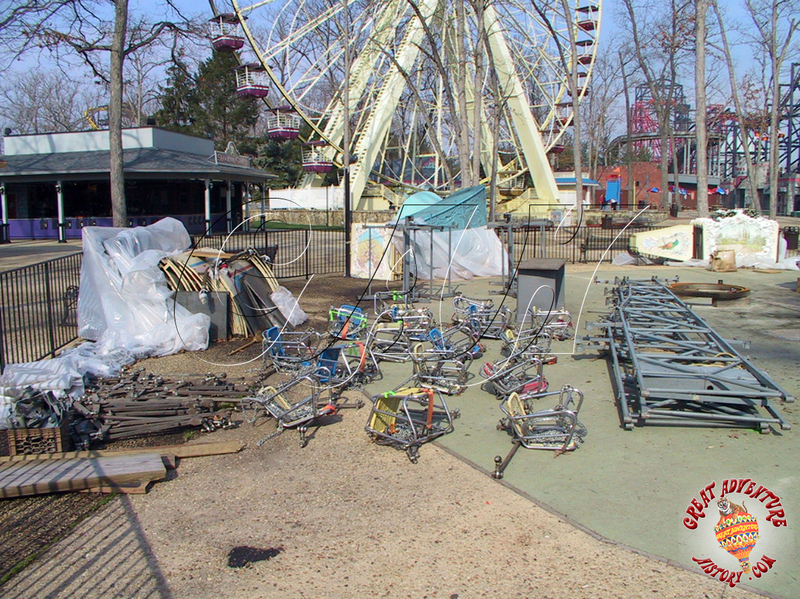 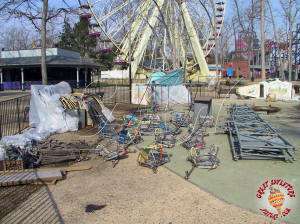 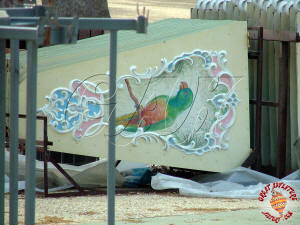 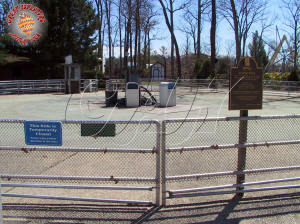 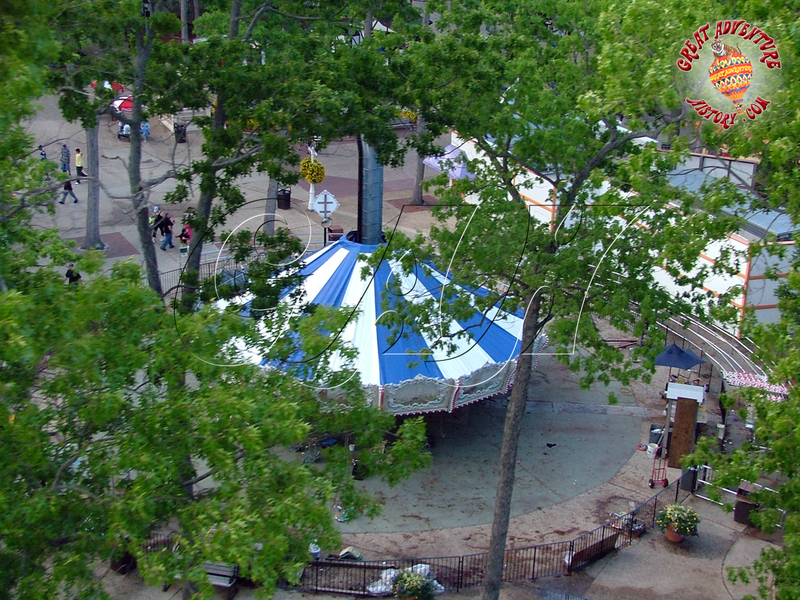 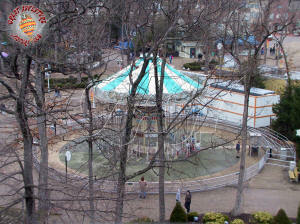 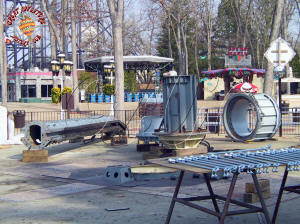 After several years of rehab work on the ride, the costs of repairs became too much and finally during the 2007-2008 off season the ride was removed from the park. 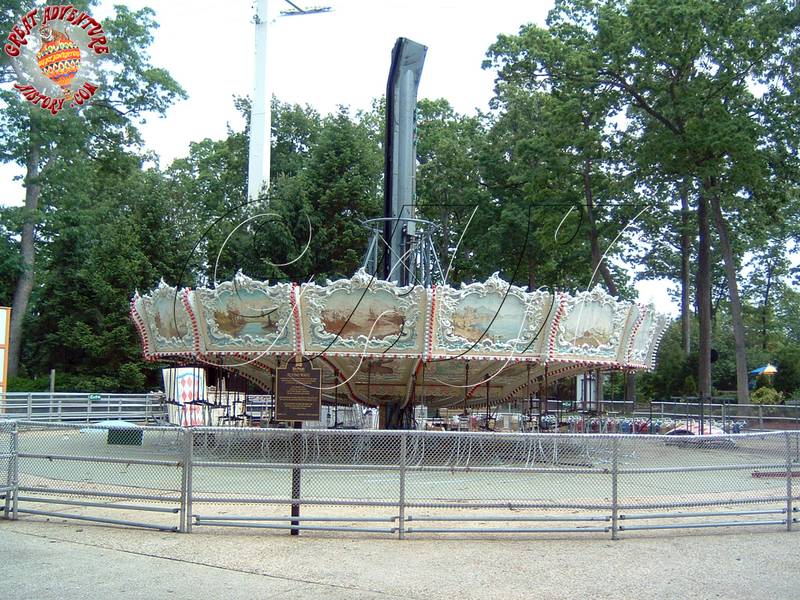 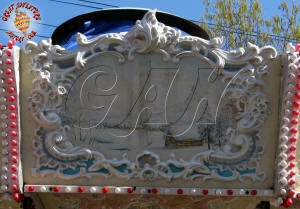 It was not the intention to remove the ride but it was financially unfeasible to make the necessary repairs. 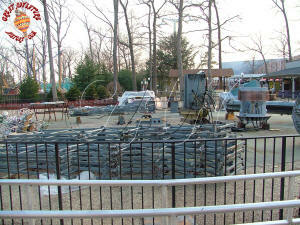 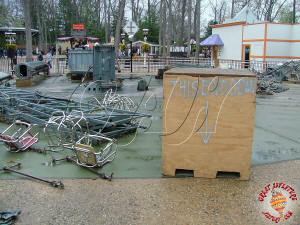 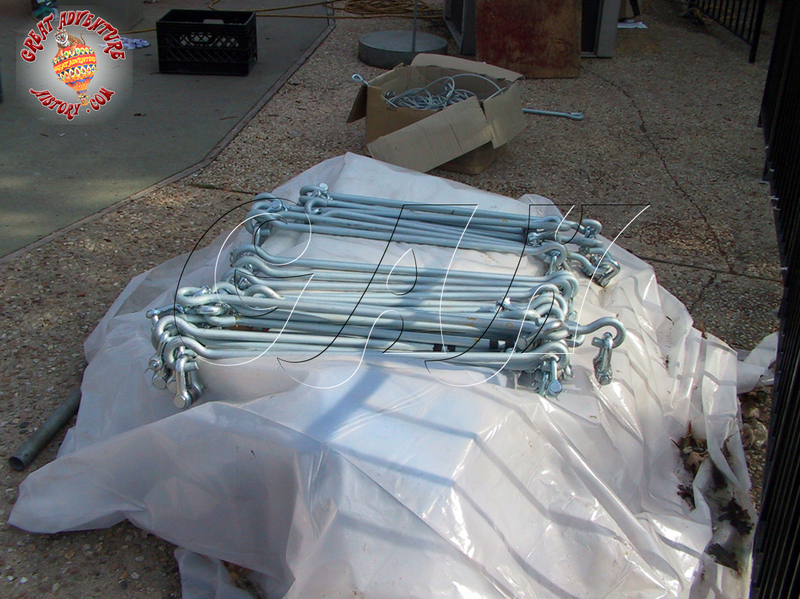 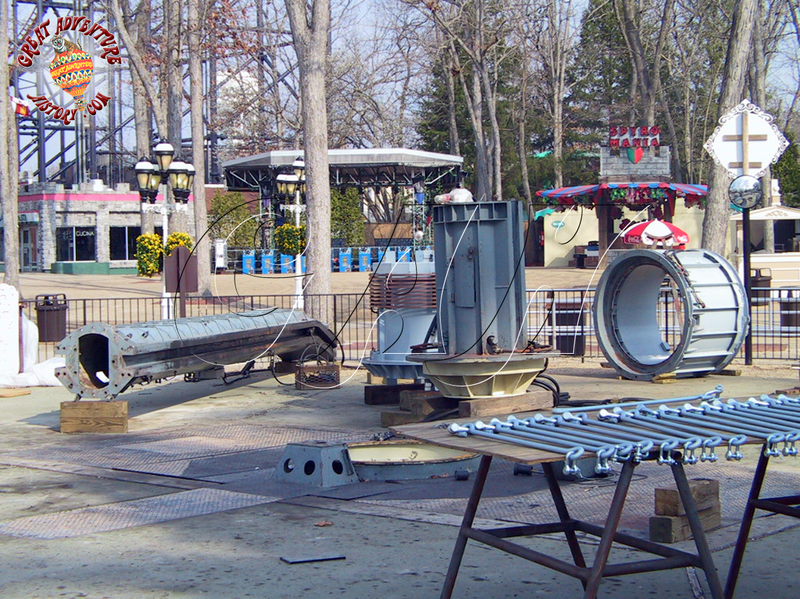 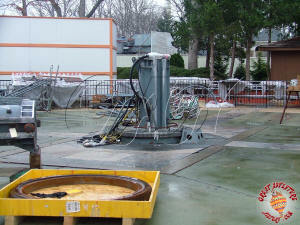 The ride's parts were moved to the park's maintenance area where they sat throughout the 2008 season, and they could be seen stacked along with other ride parts alongside the lift on Nitro. 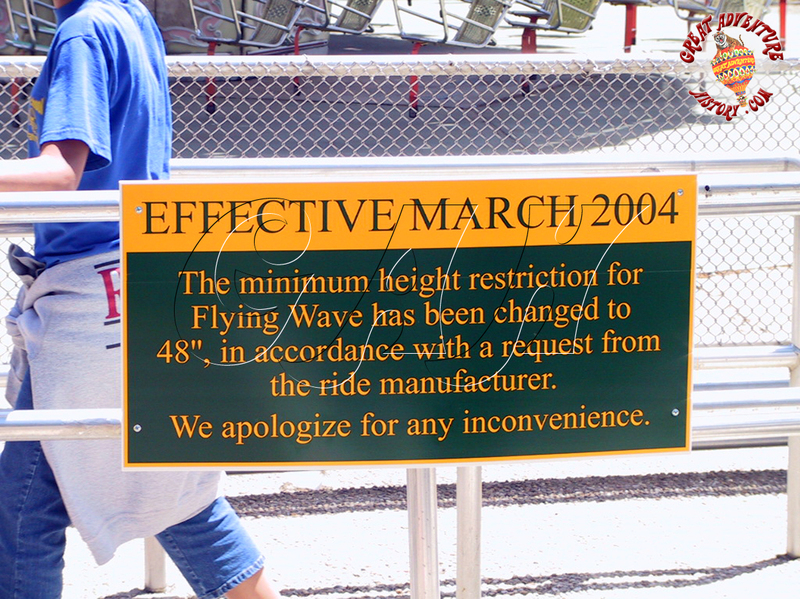 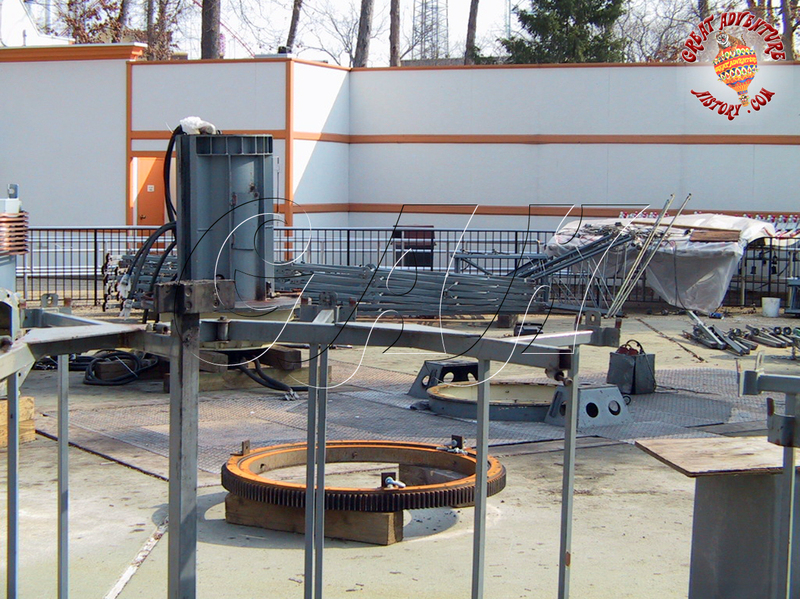 After its removal, the Flying Wave's ride site was occupied with the Turbo Bungy upcharge trampoline attraction - a far cry from the once glorious Flying Wave swing ride.